WORCESTERSHIRE ​MILITARIA MUSEUM - The Worcestershire Regiment. Infantry and Yeomanry Cavalry Regiments artefacts. 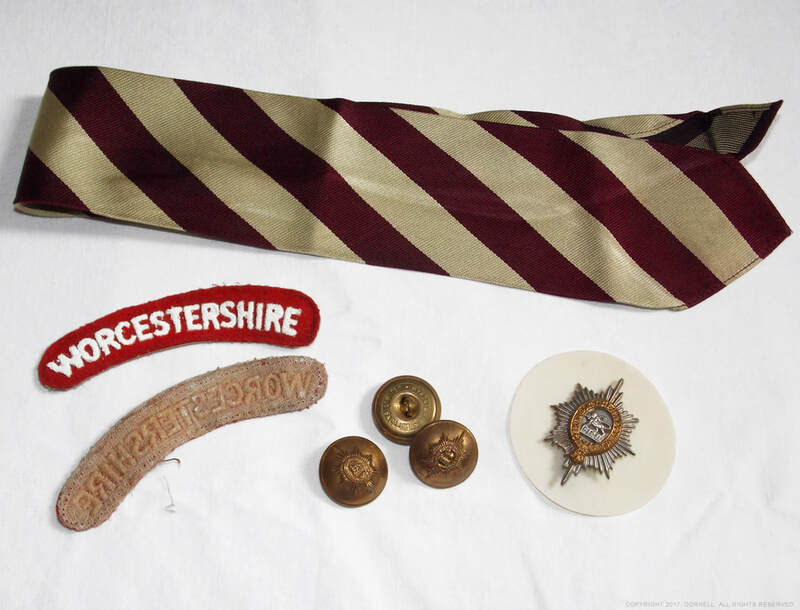 A virtual museum exhibiting a selection of uniforms, headdress and documentation related to the Worcestershire Regiment, Worcestershire & Sherwood Forester Regiment, Mercian Regiment, and the Queen's Own Worcestershire Hussars. to ​the public (hosting and internet connection dependent). WEAR A POPPY FOR REMEMBRANCE Donate. The Worcestershire Regiment is a Line Infantry Regiment that was formed in 1881, tracing it routes back to 1661. In 1970 the regiment was amalgamated with the Sherwood Foresters Regiment to become the Worcestershire and Sherwood Foresters Regiment. The WR regiment served Worcestershire and Herefordshire, in the West Midlands of England. More recent in their history the Worcesters saw action in both the First World War, being awarded nine Victoria Crosses, and Second World War. Their battle honours include Gheluvelt, Gazala, Kohima, Normandy and Tobruk, as well as Malaya. ​The First World War, 1914 - 1918. Home Service scarlet tunic named to the 7th Battalion (Territorial), Worcestershire Regiment. This wonderful red tunic belonged to Company Serjeant Major John Ashman from Dudley. Ashman served prior to and during the First World War and would eventually become an Acting Warrant Officer. Its lack of rank insignia would suggest that he wore this uniform prior to becoming an NCO sometime before 1913. Before the widespread introduction of khaki camouflage around the turn of the 20th century, the British infantry was smartly dressed in scarlet red tunics. From the Scottish Highlands to the American War of Independence, from the Peninsula War and Waterloo to the Crimea, the thin red line would become an integral part of British history. Today the British army still maintain their scarlet tradition, however it is a tradition reserved for ceremonial duties by certain regiments, such as the Coldstream Guards, and for mess dress. At the time Ashman wore this exhibit, it would have been worn with the blue Home Service spiked helmet and the blue forage cap, similar to the 1950s example exhibited. Other Ranks 1902 Pattern Home Service tunic. Scarlet red with white buff collar and pointed cuffs. White piping to the epaulettes, front button seam and rear. Bronze regimental shoulder titles with separate T7 distinctions. Brass General List buttons and regimental collar badges. Discrete ticket pocket left of the waist band. Maker is unreadable. Officer's Forage cap of Captain Louis H. Tosswill. (Late Royal Flying Corps.). Captain Louis Hope Tosswill was commissioned into the Worcestershire Regiment in 1914, as a Second Lieutenant in the 6th Battalion, a training battalion. In early 1915 he was promoted to Lieutenant and served with the 2nd Battalion on the Western Front. During the Battle of Festubert he was wounded, and it would appear that he was posted back to 6th Battalion (Reserve) to rest and recuperate from his wounds. In mid 1915 he was promoted to Captain and in December of 1916 he was seconded to the Royal Flying Corps, where he served until the end of the First World War. During the Second World War, in 1941, Captain Tosswill was recalled to active service, holding an emergency commission with the Royal Artillery. The 6th Battalion was amalgated into the 5th Battalion in early 1918. First World War Worcestershire Regiment Officer's Forage cap. 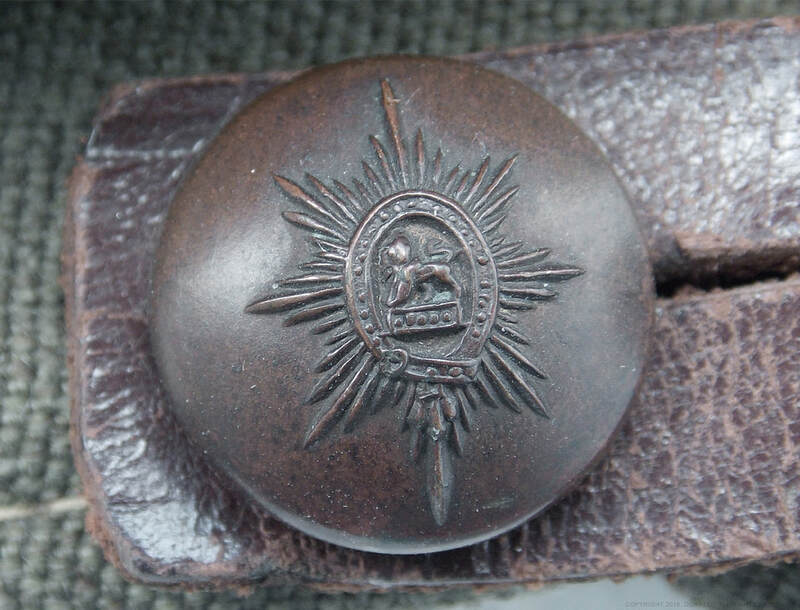 Worcestershire Regiment cap side button. Pre 1923. 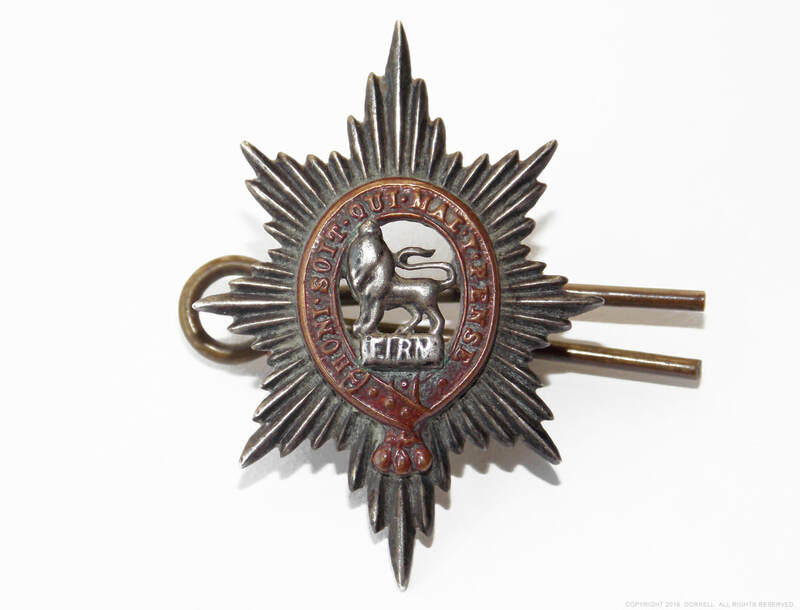 Worcestershire Regiment Forage cap badge. Pre 1923. Officer's Forage cap. Non-padded top, gilt WR side buttons with plain patent leather peak. Bi-metal cap badge. Maker is Hawkes & Co Ltd. of London. The Inter-war years, 1919 - 1938. Forage caps were worn by Officers on ceremonial occiasions with the dress uniform. This particular example dates from between 1920 and 1923. 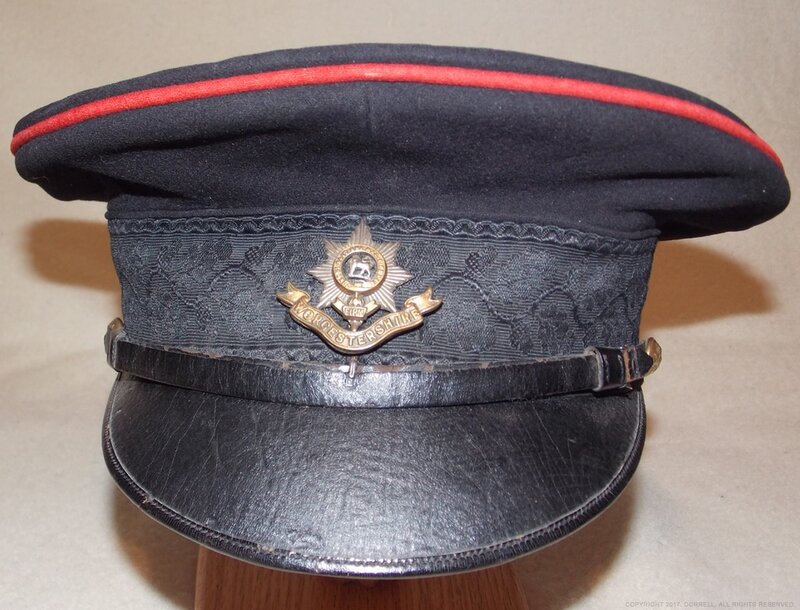 We can tell it dates to pre 1923 from the style of the cap, but most obviously, from the cap badge and side buttons, which the WR used from the start of the 20th Century until 1923. After this date the elongated star minus the scroll was used. 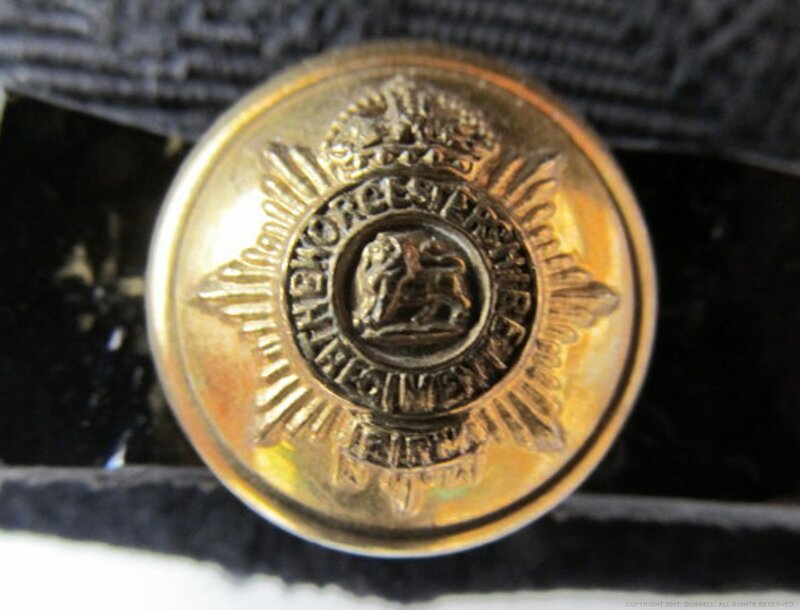 Interestingly, as caps and uniforms were an expensive piece of kit, it was not unusual for an Officer serving past the 1923 date to change the cap's badges and buttons to the newer versions. 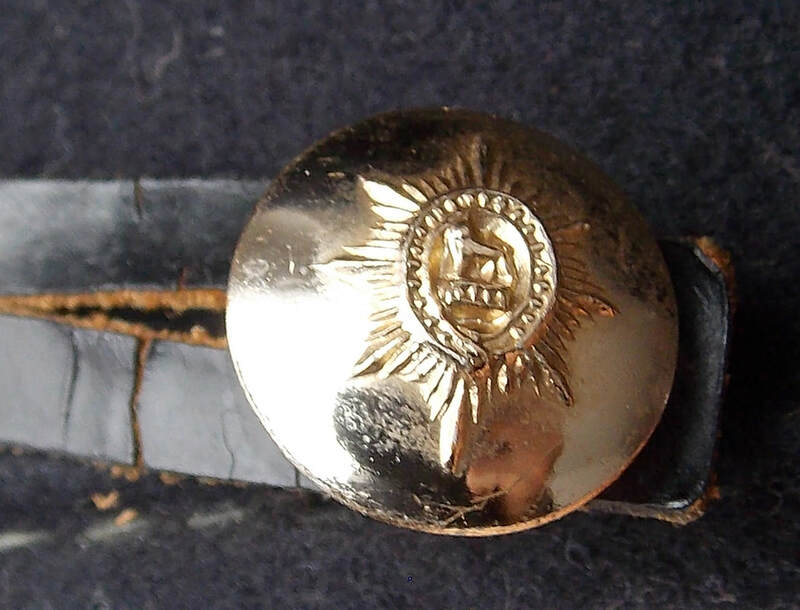 This style cap was used by Lieutenant Colonels and Majors holding Field rank distinction, denoted by the gold-wire band positioned onto the peak. Junior Officers wore a similar cap but with a plain peak. A Second World War and a 1960s example can be seen below. This example is named to an officer which appears to be W. Etnel, although the hand written script is hard to decipher clearly. 1922 Worcestershire Regiment Field Officer's Forage cap. Worcesters Forage cap maker's mark. Pre 1923 named Worcesters Forage cap. 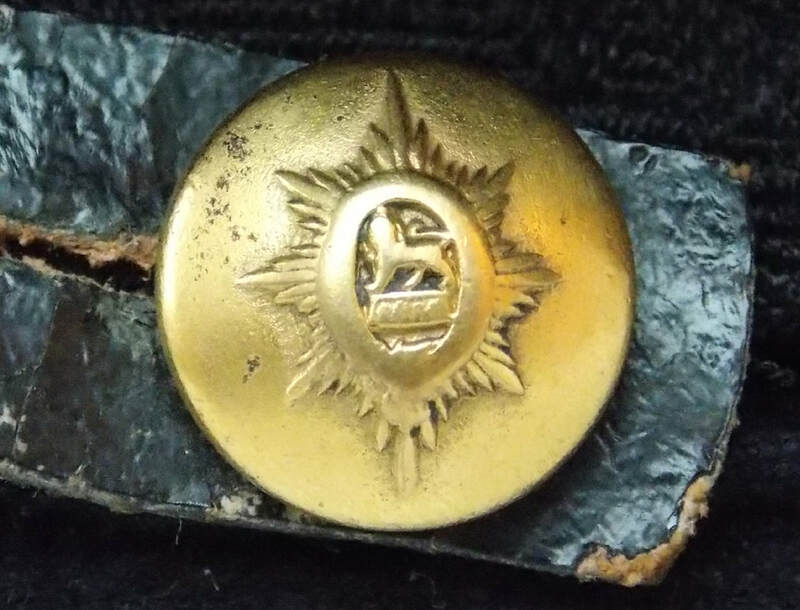 Pre 1923 Officer's gilt cap button. Field Officer's Forage cap. Gilt WR side buttons with gold-wire band peak detail. Bi-metal cap badge. Non-standard chinstrap. Maker is Hawkes & Co Ltd. of London. Officer's Mess uniform of Major J. N. C. Chichester. Major Chichester was commissioned into the Worcestershire Regiment in 1928. In 1936 he became the Adjutant of the 7th Battalion (TA) with the rank of acting Captain. By the start of the Second World War he was a confirmed Captain and served with the 1st Battalion in 1943. Major Chichester retired from active service in 1948. Late 1930s Worcestershire Regiment Officer's Mess jacket. 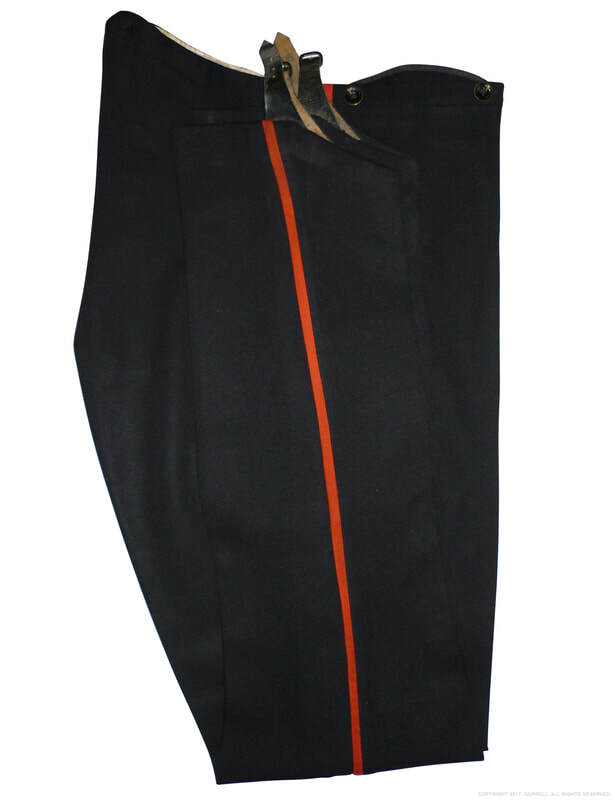 Late 1930s Worcestershire Regiment Officer's Mess trousers. Officer's mess jacket. Scarlet red with black felt lapels and red lining. 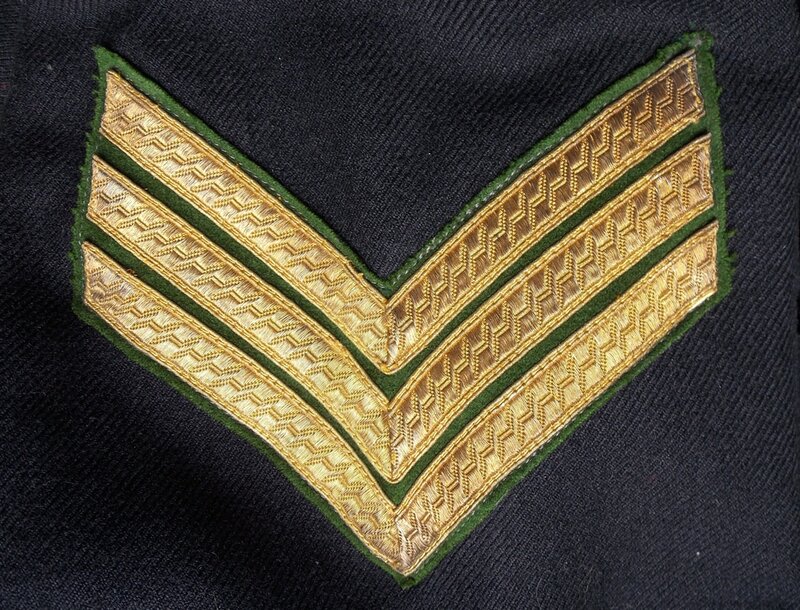 Has QC embroidered rank crowns on epaulettes denoting rank of Major. WR collar badges mounted on lapels (left one is missing). 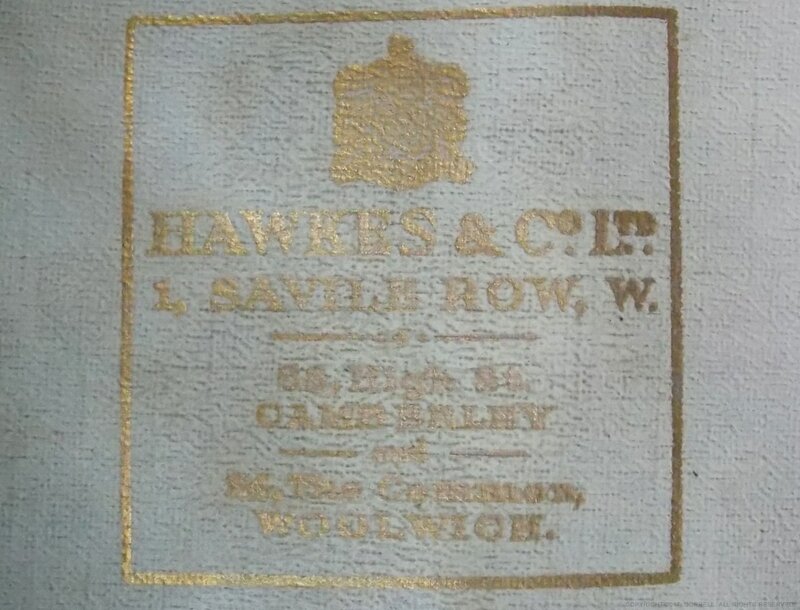 Maker is Hawkes & Co. Ltd. Dated 1938. Matching mess trousers to jacket. Heavy black cloth with 1/4 thickness red stripe down each leg. Button fly. Leather boot fasteners at ankles. Maker is J. B. Johnstone. Officer's Service Dress jacket and knickerbocker breeches, belonging to a 2nd Lieutenant. 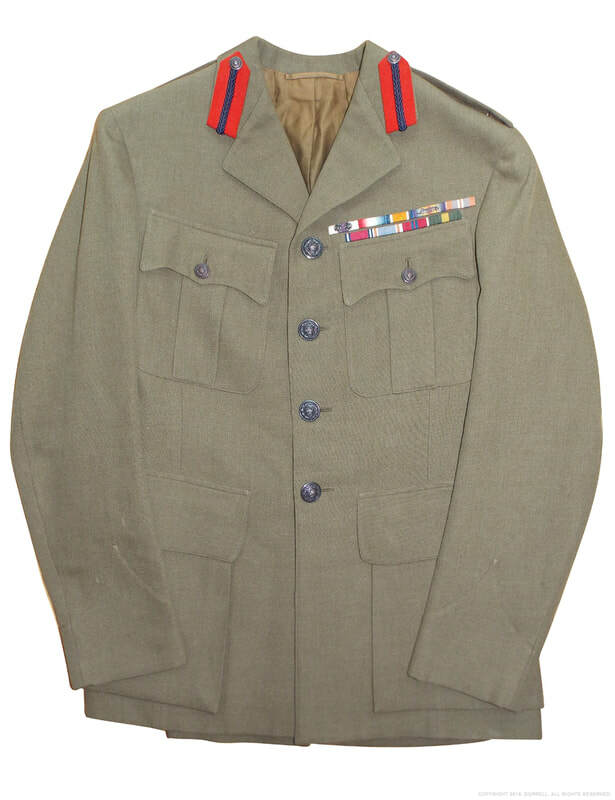 This uniform group, unfortunately unnamed, is typical of those worn by Officers during the inter-war period and very early on, in the Second World War. 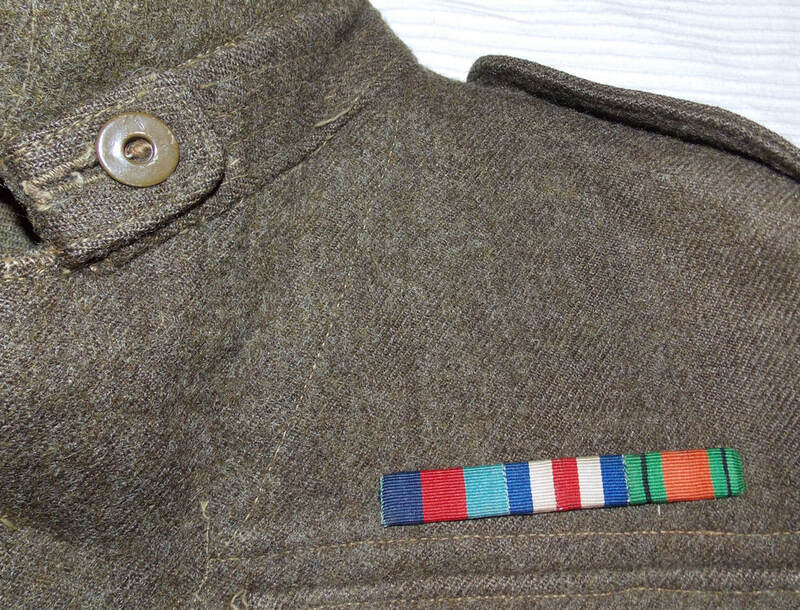 The tunic has had its WR collar badges and rank pips removed, but still shows evidence of where they were originally fitted. An officer's Sam Browne belt would have been worn with this tunic, or alternatively a cloth belt similar in style and configuration to that worn on the following tunic example, depending on the occasion. Found in the a pocket were two Worcestershire Regiment cap badges (with slides attachment). Matching to the jacket's colour and material is a pair of Knickerbocker breeches. These Officer's breeches are not so "balooned" as the Mounted pattern, and would have been worn with cloth puttees, (a length of cloth wound around the shin area of the leg so as to cover the top of the boot and the lower seam of the breeches). 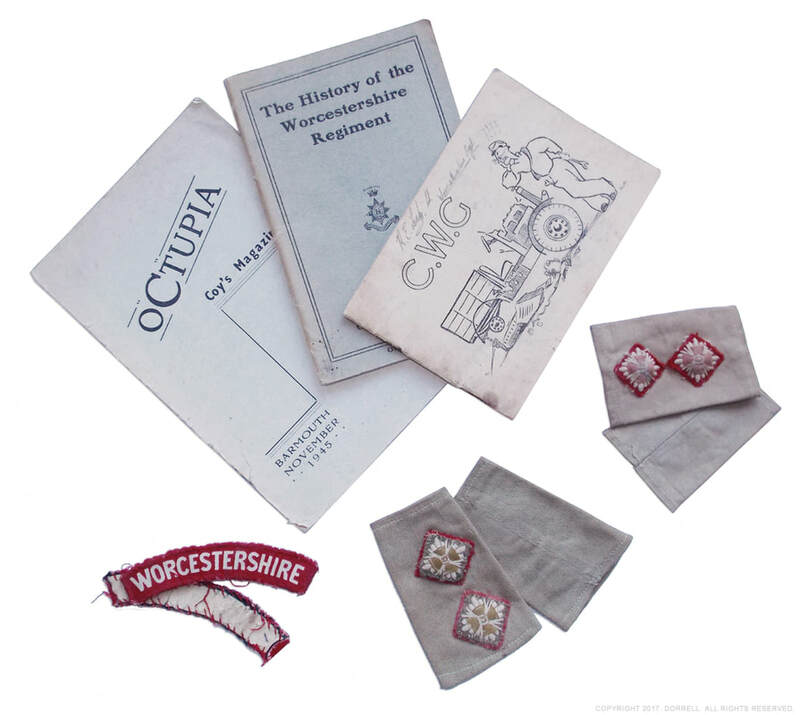 An example of how this grouping would have looked when worn can be seen on the Worcestershire Regiment Website. 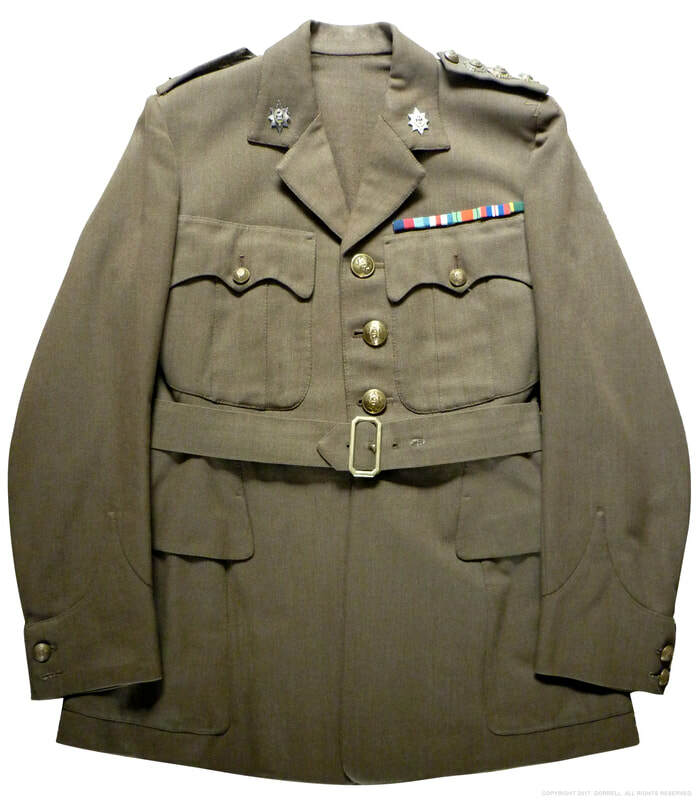 Worcestershire Regiment Officer's Service Dress tunic circa late 1930s. 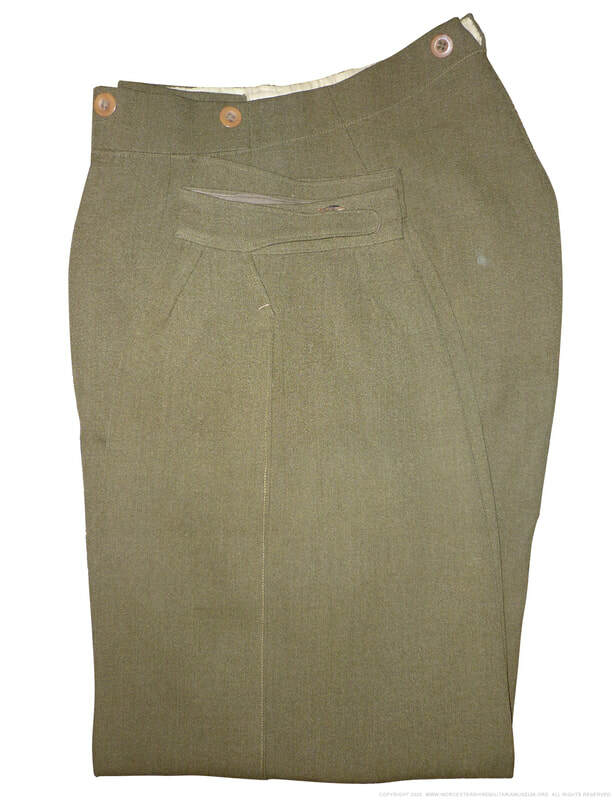 Worcestershire Regiment Officer's Knickerbocker Breeches, circa late 1930s. 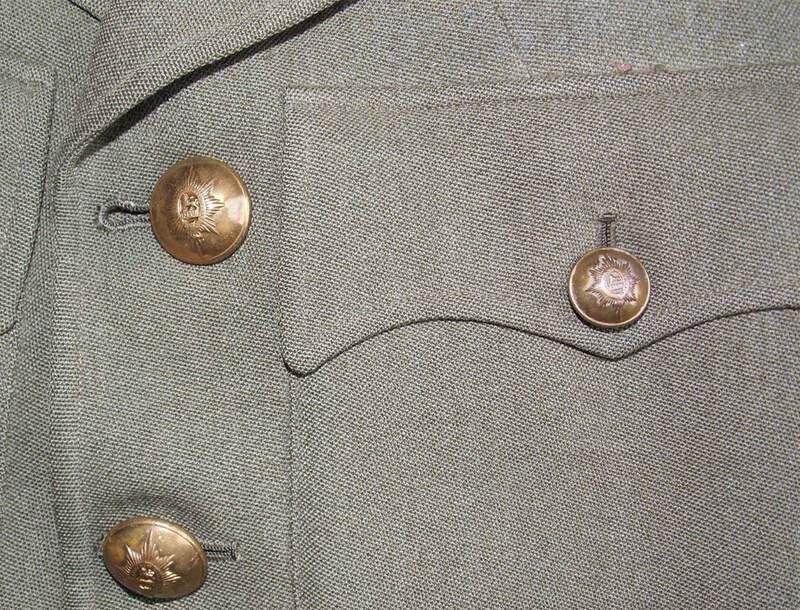 Officer's service jacket with brass WR buttons (made by J. R. Gaunt, London). Missing rank pips denoting that of 2nd Lieutenant. Maker is Alkit Ltd. Matching Knickerbocker breeches to jacket, with side trouser pockets. Knee length with clay/brown buttoned fly and blackened metal buckles, used to tighten each lower leg seam. The inner waist lining is "pijama" style - white with blue pinstripes. Other Rank's 1901 Pattern Service Dress cap. The 1901 Pattern Service Dress cap was introduced, as its name suggests, at the start of the 20th Century. Its overall design altered little over its lifespan, although early and First World War examples featured a narrower chinstrap and different lining, while later examples also had a sewn seam at the top of the band as can be noted below. World War I examples would also have been fitted with the bronze pre-1923 cap badge. 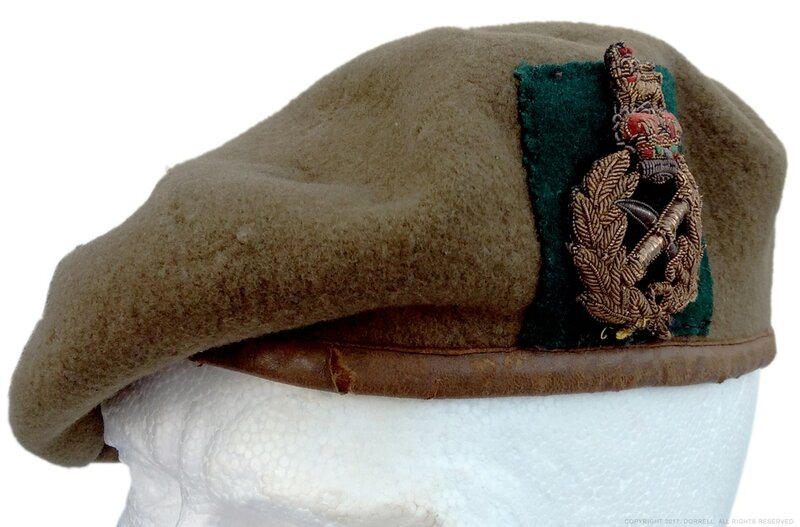 The highlighted example is the last version of this cap, which was used by the Worcestershire Regiment during the late 1930s and into the early years of the Second World War, before it was quickly dropped in favour of the more practical FS cap. 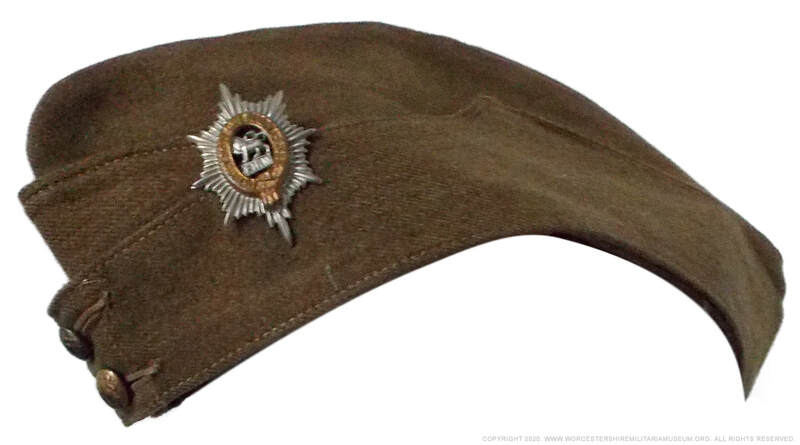 When the 1st Battalion was sent to Palestine in 1938, to support the garrison during the Arab Revolt, the 1901 Pattern cap was clearly being worn. For more information on this deployment as well as some excellent photographs showing such caps in use, please spare a few minutes to visit this link. Worcestershire Regiment Other Rank's Service Dress cap. 1901 Pattern Other Ranks SD cap lining. Late interwar period. Bronze GL side buttons and bi-metal cap badge, with slide attachment. Maker unknown. An armband from a soldier of the Worcestershire Regiment, acting as a regimental Provost Sergeant. Worn on the upper right sleeve of the Service Dress jacket. Grass green cloth armlet with brass lettering and bi-metal cap badge. Maker unknown. Books attaining to Lt. Colonel Michael Alured Hamilton Cox. Lieutenant Colonel Hamilton Cox was commissioned a Second Lieutenant in 1911. Just prior to the start of the First World War he was serving in Cairo, Egypt with the 1st Battalion. The battalion was swiftly shipped back to Britain and saw action on the Western Front. In September 1914 Hamilton Cox was promoted to Lieutenant and was one of the lucky survivors of the 1915 Battle Neuve Chapelle, where the battalion was decimated. In August 1915 he was promoted to Captain and after the war, in 1921, became Adjutant. By 1926 he was serving in Allahabad, India, in charge of "A" company. In 1933 Hamilton Cox was further promoted to Major and when the Second World War began he was quickly promoted again to Lieutenant Colonel. He retired his commission in late 1945. 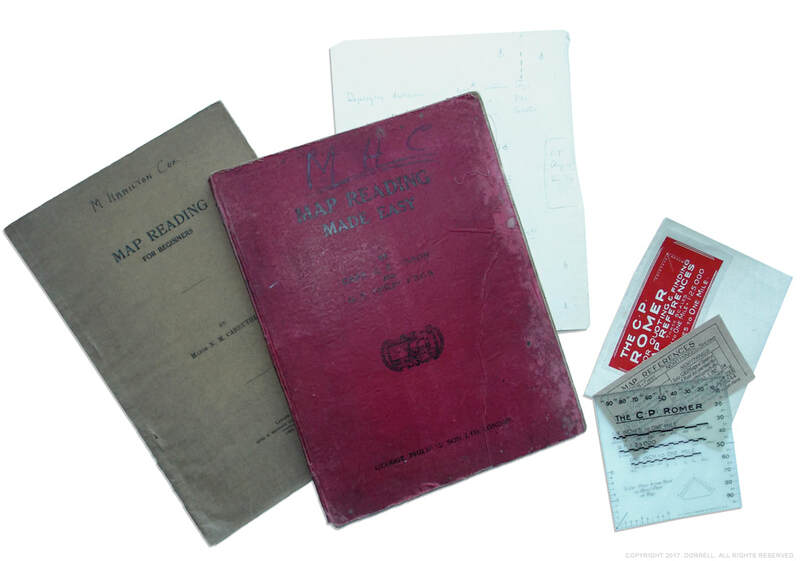 ​"Map Reading Made Easy" and "Map Reading for Beginners" belonged to Hamilton Cox and were used by him during the 1930s. The books are both named while the former includes a hand written calculation note on a scrap of paper, as well as a small set of celluloid map reading instruments and a 1932 dated letter from the Worcestershire Regiment concerning a war game exercise. To see a photo of this fine officer and read more about his posting to India please visit this link. Map reading books from Lieutenant Colonel Hamilton Cox. The Second World War, 1939 - 1945. Officer's Uniform jacket of A/Captain Roger Eustace Cleverley. Captain Cleverley was captured at Dunkirk in 1940 and remained a POW for the duration of the Second World War. During this period he became an inmate at the infamous Oflag IV - C, otherwise known as Colditz. 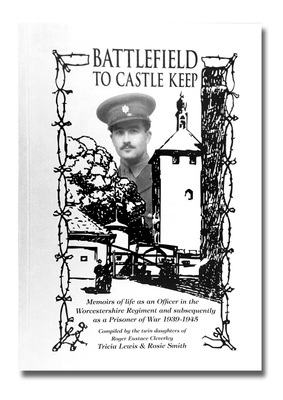 Captain Cleverley's experiences were recorded in the book, "Battlefield to Castle Keep: Memoirs of Life as an Officer in the Worcestershire Regiment and Subsequently as a Prisoner of War 1939-1945". Second World War Worcestershire Regiment Officer's Service tunic. A hard to find copy of the book "Battlefield to Castle Keep: Memoirs of Life as an Officer in the Worcestershire Regiment"
Second World War Worcestershire Regiment Officer's Service cap. Officer's service jacket with brass WR buttons and rank pips denoting that of Captain. 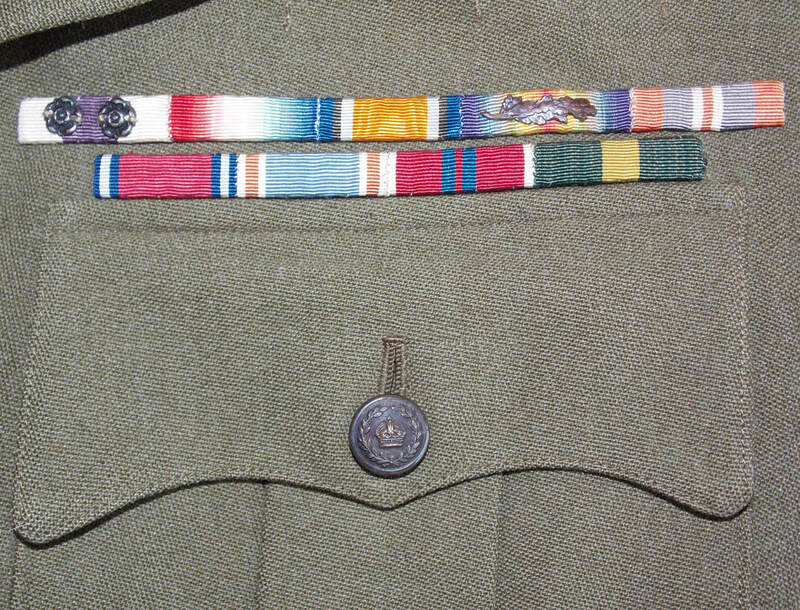 Campaign medal ribbons, including that of the Territorial Efficiency Medal. Matching Service cap. Brass WR side buttons and silver cap badge. 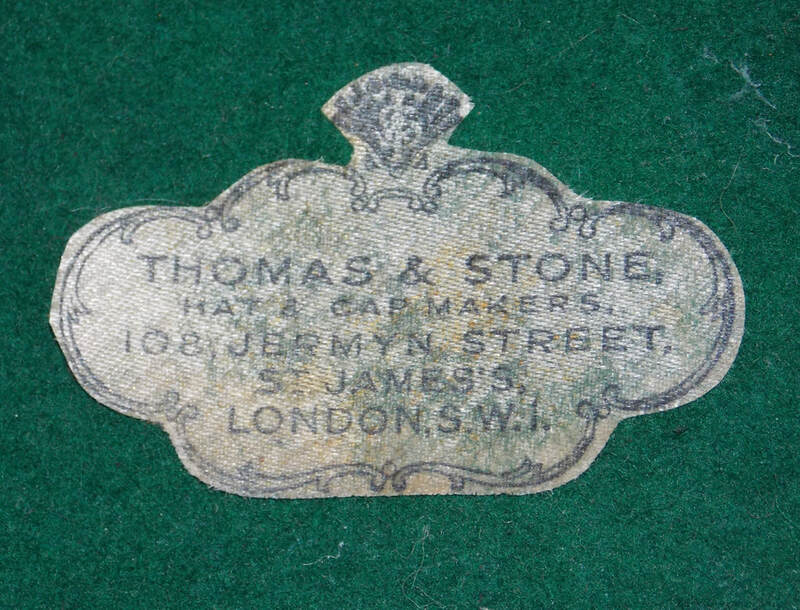 Maker is Thomas & Stone of London. Colonel's War Economy Service Dress jacket. Unfortunately there is no supporting information as to whom originally owned this tunic, being un-named and having had it's maker's label cut out. However the jacket itself does tell us something about its original owner. He was a distinguished officer, evident from where his medal ribbon was once attached, and most probably served as a Commanding Officer of one of the wartime Battalions, before being promoted to Substantial Colonel. The jacket is a mid wartime economy pattern, lacking the pleated lower pockets as well as any inner pockets. 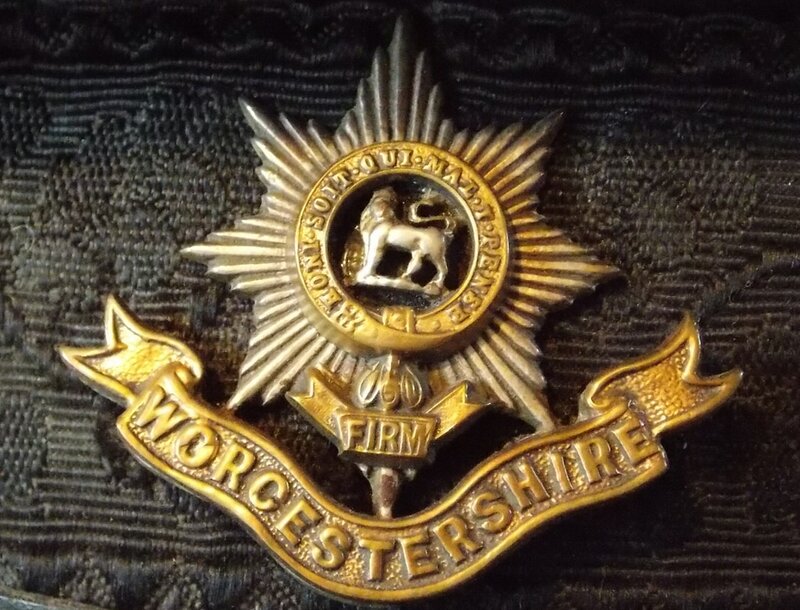 It also still retains its original Worcestershire Regiment buttons, as opposed to those worn by a full Colonel, confirming it as being an economy measure resulting from promotion in wartime. Interestingly the upper shoulders seem to show where a square division patch was once sewn. Perhaps that of the 43rd Wessex Division. Second World War Worcestershire Regiment Colonel's Service Dress jacket. Senior officer's service jacket with bronze regimental buttons and rank insignia denoting that of full Colonel. Red felt collar gorget with red cord detailing. Missing medal ribbons but shows evidence of where once was. Maker unknown. Deputy Lieutenant‘s Uniform jacket of Colonel William Ralph Prescott M.C., T.D., D.L., J.P.
William Ralph Prescott was born in 1894 in Kensington. After a distinguished military career he became a Deputy Lieutenant, possibly from late 1940 until 1953, as well as a Justice of the Peace. In 1982, at the age of 87 he passed away. During the First World War he served on the Western Front and in Italy, winning the Military Cross on no less than three occasions, twice in one year, as well as being Mentioned in Dispatches. In 1917 he was wounded at the Gillemont Farm action and a year later during the last Austrian push of the war. After the war he served in the 2nd, 4th and 7th Battalions, as an Adjutant of both the 2nd and 7th, before becoming the CO of the 7th Battalion from 1932 - 1936. In 1932 he was also promoted to Lieutenant Colonel and then Substantive Colonel in 1936. During the Second World War he briefly commanded the 184th Infantry Brigade before taking over command of the 9th Battalion in October 1939 until October 1940. After retiring from the army Colonel Prescott MC DL became the honorary Colonel of the 7th Worcestershire Regiment. This tunic was acquired by Lieutenant Colonel Prescott in 1939 and worn by him through the war with the Worcestershire Regiment and then during his tenure as a Deputy Lieutenant. More information about him can be found here. 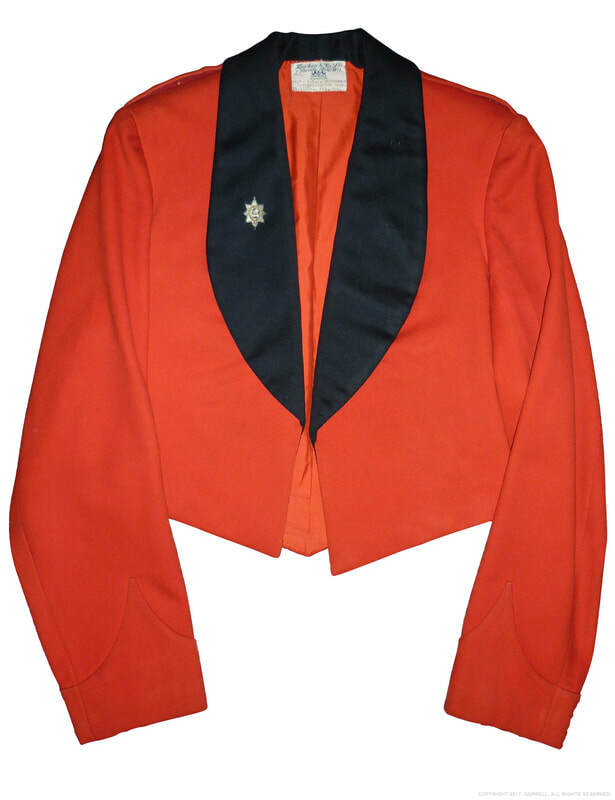 Deputy Lieutenant‘s Service Dress jacket of Colonel William Ralph Prescott M.C., T.D., D.L., J.P. Bronze Deputy Lieutenant of an English county epaulette rosette insignia. Medal ribbons of Colonel William Ralph Prescott M.C., T.D., D.L., J.P. including the MC with two bars. Colonel William Ralph Prescott M.C., T.D., D.L., J.P. late of the Worcestershire Regiment. 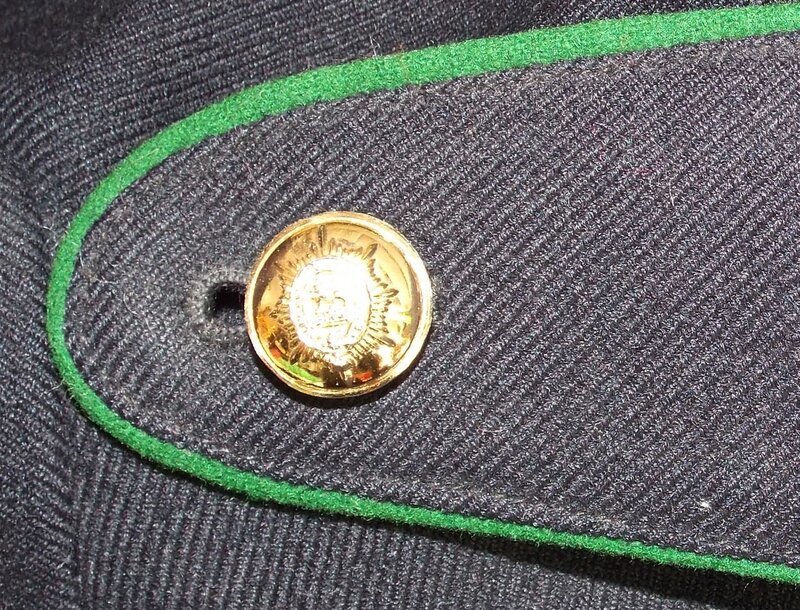 Named officer's service jacket with bronze King‘s crown Deputy Lieutenants buttons. Red felt collar gorgets with blue cord detailing. 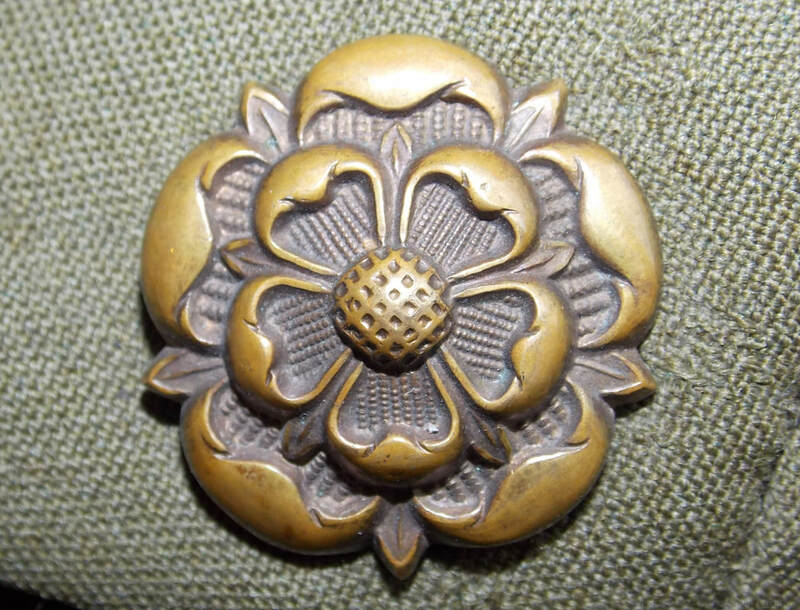 Brass English DL epaulette insignia. Medal ribbons for Military Cross with bars, 1914-15 Star, British War Medal, Victory Medal with oakleaf, War Medal 1939-1945, 1935 King George V Silver Jubilee Medal, 1937 King George VI Coronation Medal, 1953 Queen Elizabeth II Coronation Medal, Territorial Efficiency Medal. Maker is H. Huntsman & Sons Ltd. of London. 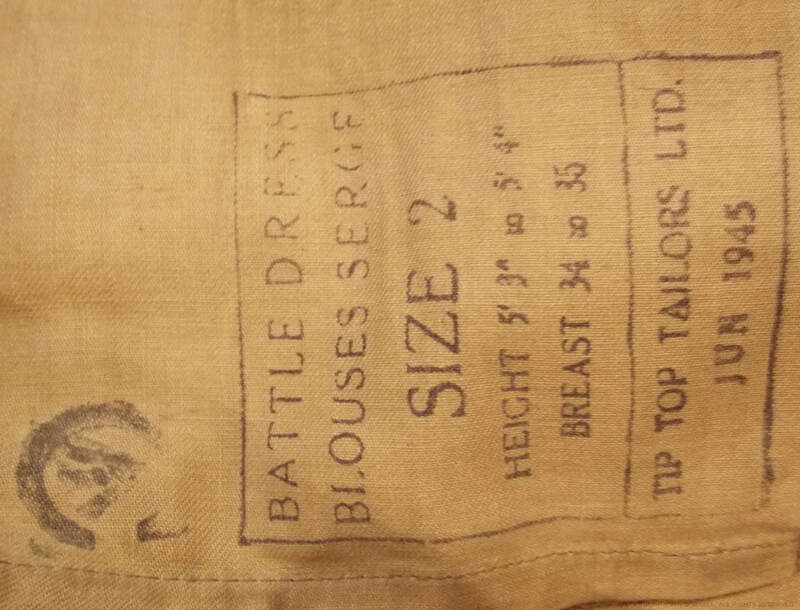 A typical late war example of a Canadian made British Officer's Battledress Blouse. 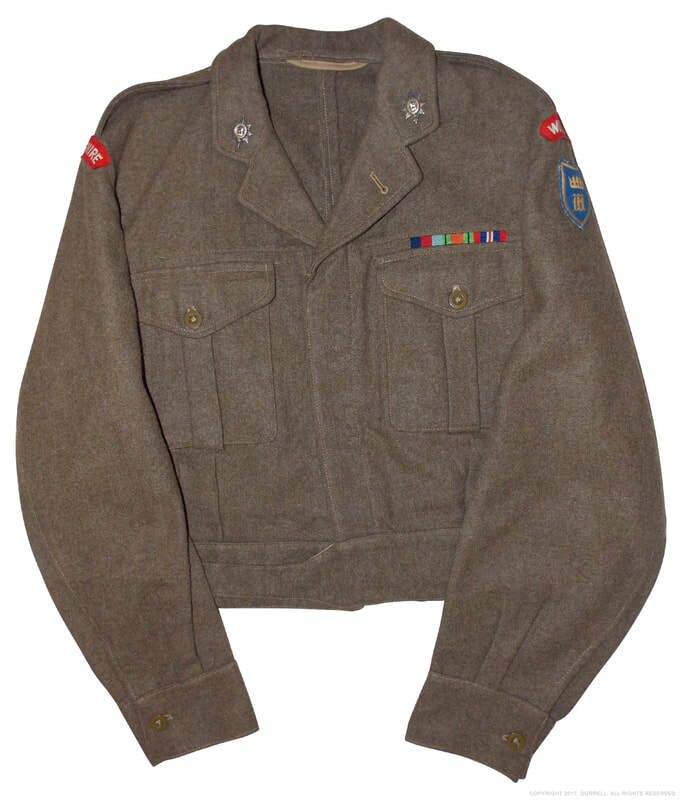 Originally adopted in 1936 for Officers and men, the Battledress was used well into the postwar years, worn in conjunction with the Service Cap, FS cap, GS cap, beret or steel helmet. The maker's markings, along with the button collar tab and distinctive button shape show this Blouse's Canadian origin. The centre seam at the rear also indicates it as being a wartime example. While the Blouse is unnamed we are able to tell that the Officer saw service in North West Europe, possibly enlisting in 1941 and acquiring his commission in late 1944, which would account for the Officer's low rank but long service acknowledgement. Second World War Worcestershire Regiment Officer's Battledress Blouse. Late war "Worcestershire" regimental designation, with scarlet background and white lettering. 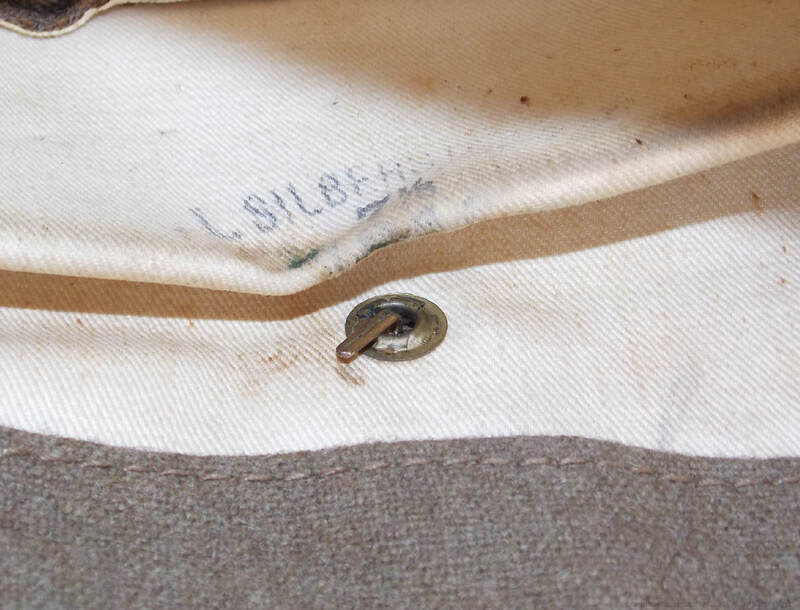 Battledress collar tab and button detail. The medal ribbon bar is attached with split pins. Canadian Battledress marking for Tip Top Tailors. 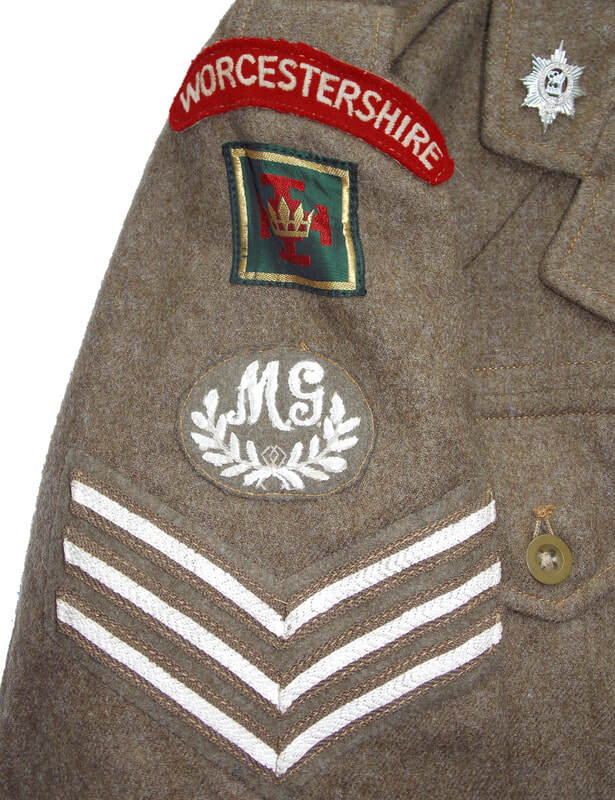 Officer's Battledress Blouse jacket with Worcestershire shoulder titles and cloth rank pips denoting that of Second Lieutenant. Worn on the lower sleeve are four red Service Chevrons signifying 4 years of active service. The campaign medal ribbons display the 1939–45 Star, the France and Germany Star and the Defence Medal. Maker is Tip Top Tailors. ​A junior officer's Forage cap, worn by the ranks of Second Lieutenant, Lieutenant and Captain. Second World War Worcestershire Regiment Officer's Forage cap. Worcestershire Regiment cap side button WWII. Officer's Forage cap. Gilt WR side buttons. Maker is Thomas & Stone of London. 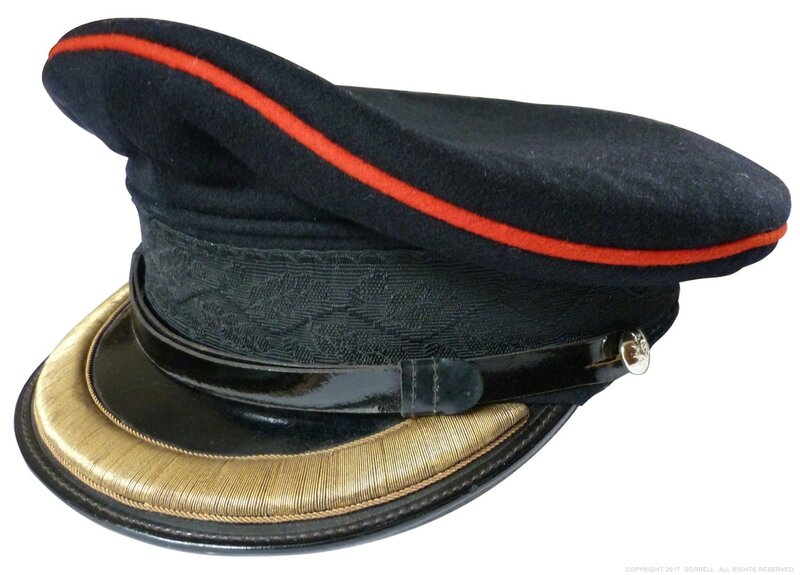 ​A Wartime Forage cap worn with the dress uniform. Such a cap can be seen in a period portrait photograph of Captain H. W. Sargeant (B Echelon), who served at Tobruk. Second World War Worcestershire Regiment Officer's Forage Dress cap. Worcestershire Regiment cap side button. 1923 - 1970. Field Officer's Forage cap. Gilt WR side buttons with gold-wire band peak detail. Maker is Moss Brothers of London. This attractive saddle shaped service cap is made from the typical barathea wool and most probably dates to late war period, possibly even early postwar. It features rather subtle browned bronze regimental side buttons and interestingly has had the sweatband cut out by its original owner. Whilst that is unusual it is by no means unheard of, making the cap more comfortable to wear, especially if the officer was wearing it constantly for everyday use. WWII Worcestershire Regiment Officer's SD cap. Worcestershire Regiment browned bronze cap button. Worcester Regiment SD cap lining. 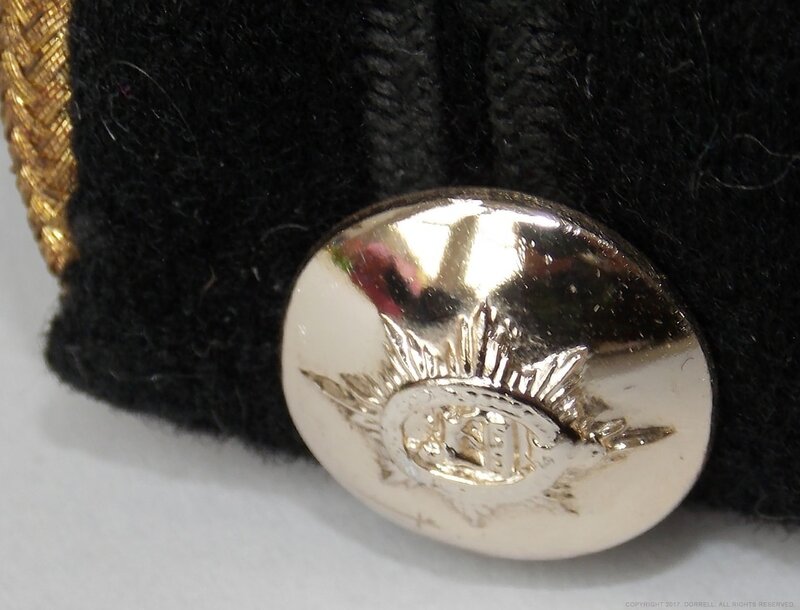 Officer's Service Dress cap. Browned bronze WR side buttons with silver plated cap badge. Maker is Rowans of Glasgow and Birmingham. 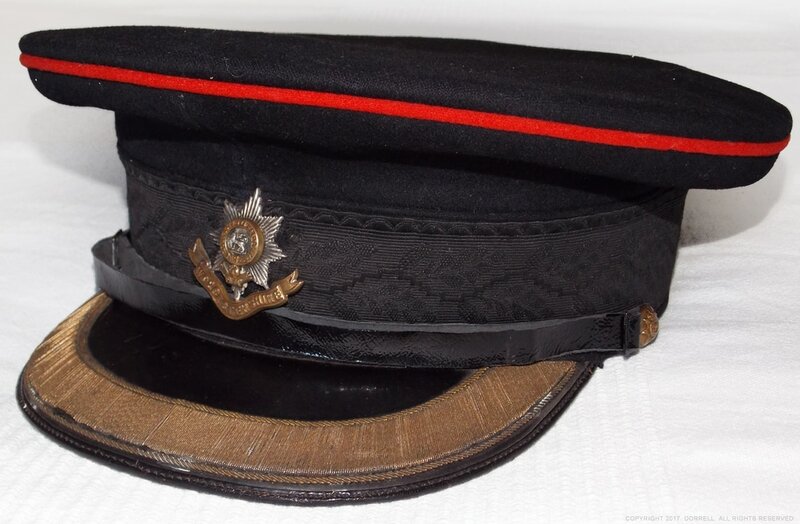 ​This late wartime Service Dress cap is unfortunately unnamed but does show significant wear and repair. 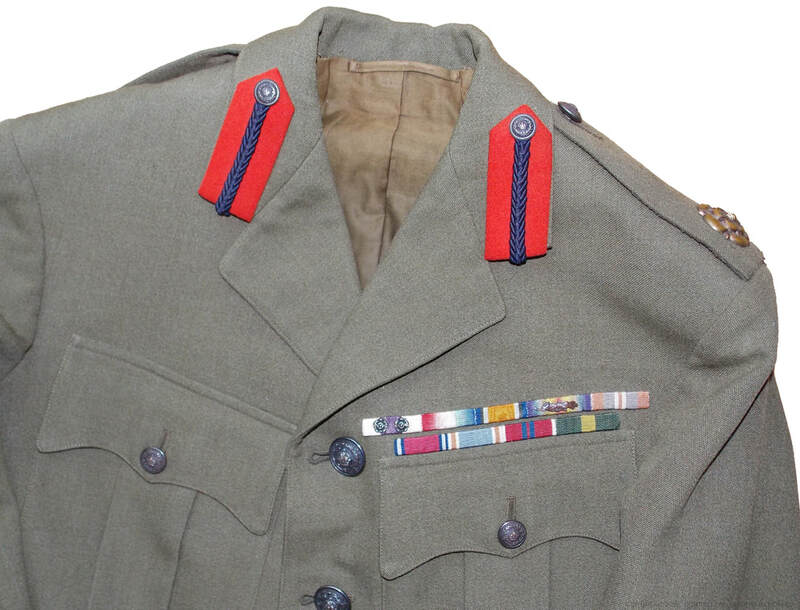 The wearing of General List buttons for Officer's of other regiments appears to be a trait of wartime, and in this case, the particularly wide chinstrap suggests it as being late war period. Brass GL side buttons and bi-metal cap badge. Maker is Paisleys of Glasgow. Soldier's Slouch hat. 7th battalion Worcestershire Regiment. 2nd Division. The slouch hat (or bush hat) was issued to those units sent to fight the Japanese, in the Far East. 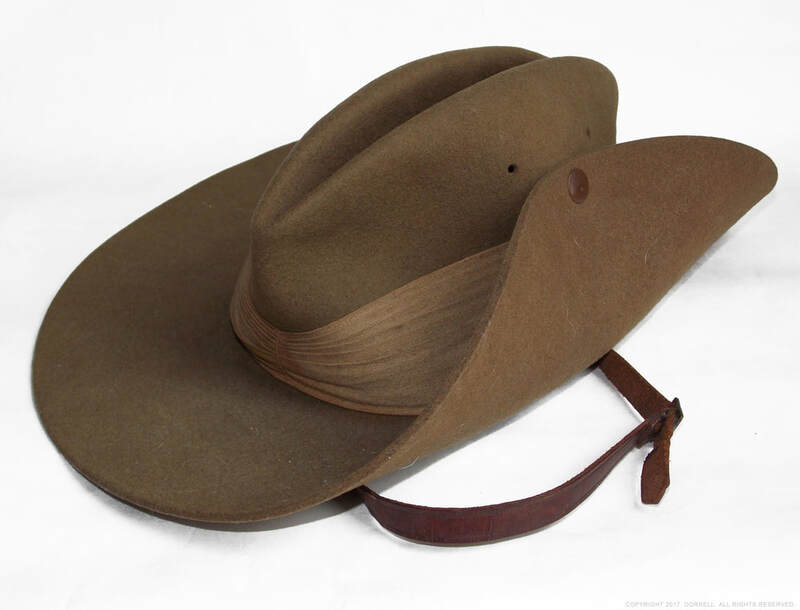 The hat is iconic and typically associated with Australian forces as well as the Gurkhas. Its felt body would provide good sun protection for the head and shoulders and a moderate protection against rain. The side flap on the left could be folded up to allow the hat to be worn when shouldering arms. Regimental or unit designation was shown by flashes or patches either worn on the pugaree or on the upturned flap. The Worcestershire Regiment wore a green diamond patch on the left of their pith helmets and slouch hats, which is stated in pith helmet dress regulations. 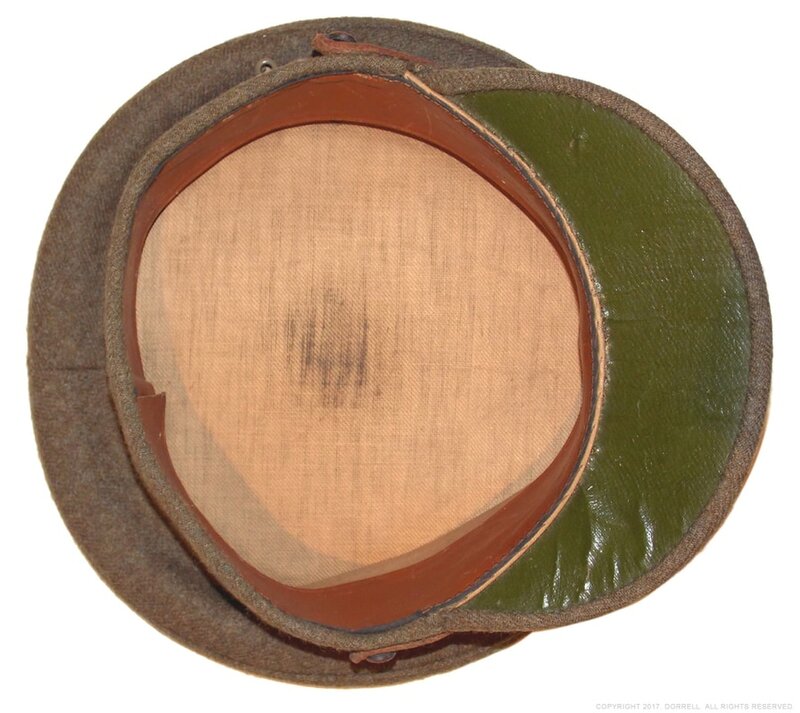 Although on this particular example the patch appears larger, while its colour is slightly darker than the two Coloured FS cap examples below, suggesting that the green shade could vary, and perhaps as mentioned below in the account of 2nd Lt. Edwards, this examole was theatre applied. "Major D. H. Nott DSO MC... was dressed in a sheepskin jacket and an Indian Army cap, similar to an Australian hat with the left side brim up and an emerald grass green diamond supporting the regimental badge on the turned up part of the brim. I soon acquired similar headgear". 2nd/Lieutenant Hugh Knowles Edwards, 1st Battalion Worcestershire Regiment, 1942. Aside from the stated use of slouch hats by members of the 1st Battalion at Tobruk in 1942, both the 2nd and 7th Battalions of the Worcestershire Regiment serving in the Far East would have been issued with such a hat. from 1942 - 1945, as the hat appears to be a mid-war pattern without a rim. Close-up view of flash with regimental badge. More importantly however, a near identical hat can be clearly seen in a 1945 period photograph of a group of men from the 7th Battalion, at the Worcestershire Regiment website. Slouch hat showing flap worn in the up position. Slouch hat showing the normal style of wear, revealing the unit flash. Khaki felt body with tan pugaree band. On left of the band is a green emerald diamond patch fitted with a WR collar badge. The sweatband is missing and thus the maker and hat's date. Brown leather chinstrap. Flap rivets maker is Newey Brothers of Birmingham. Similar to the officer’s cap badge in design, the collar badge was notably smaller, measuring 35 mm in height. ​It was worn as a matching pair on the Service Dress tunic, Patrol jacket and mess dress. 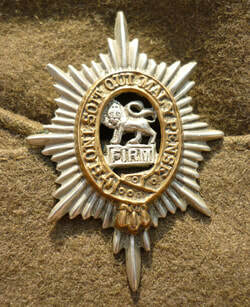 While the right badge reflects the cap badge, the lion on the left one is facing inwards. Furthermore, Officer’s patterns were usually more expensive although, as with the Other Ranks, bi-metal was also worn. 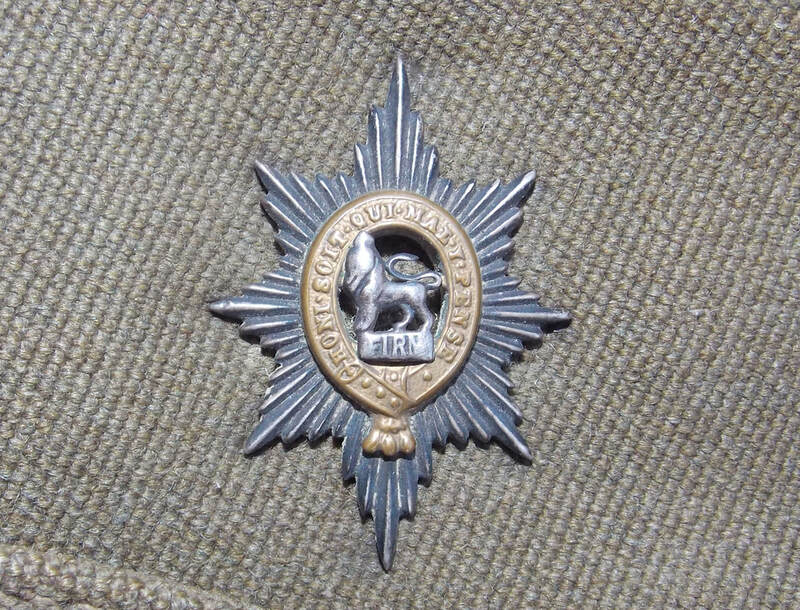 This single right pattern badge suggests that it was not used as a collar badge, but instead as a cap badge, most probably from an officer’s Coloured Field Service cap. A special thank you to Mr Peter Downing for kindly donating this exhibit. Worcestershire Regiment officer's badge rear side. 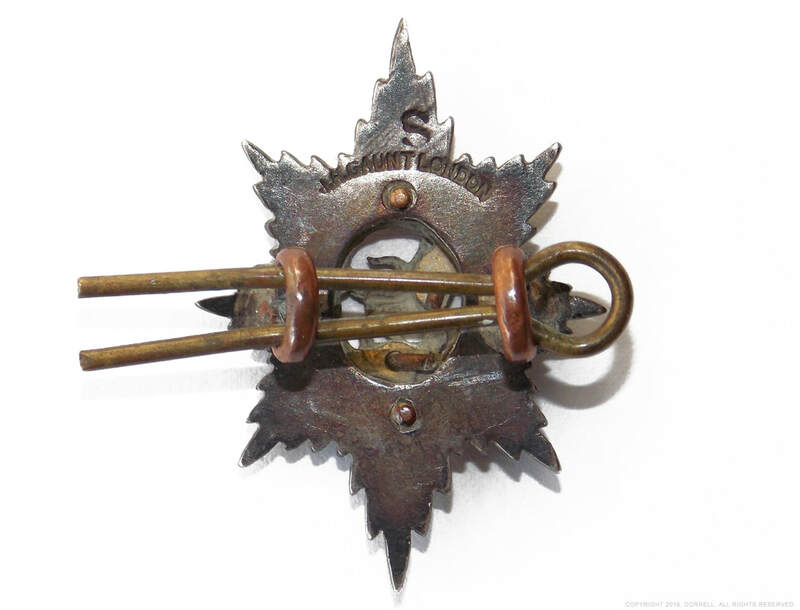 Regimental collar badge cap badge, with prong and loop attachment. Maker is J. R. Gaunt of London. 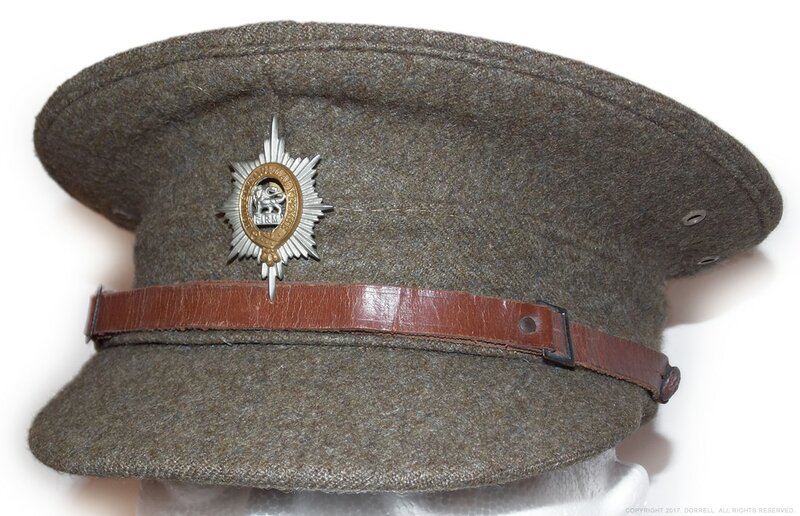 A nice example of an officer's wartime FS cap with the period measure General List pattern buttons. Interestingly the hat features a smaller sized badge, that used on the tunic collar, as opposed to the regulation cap badge. 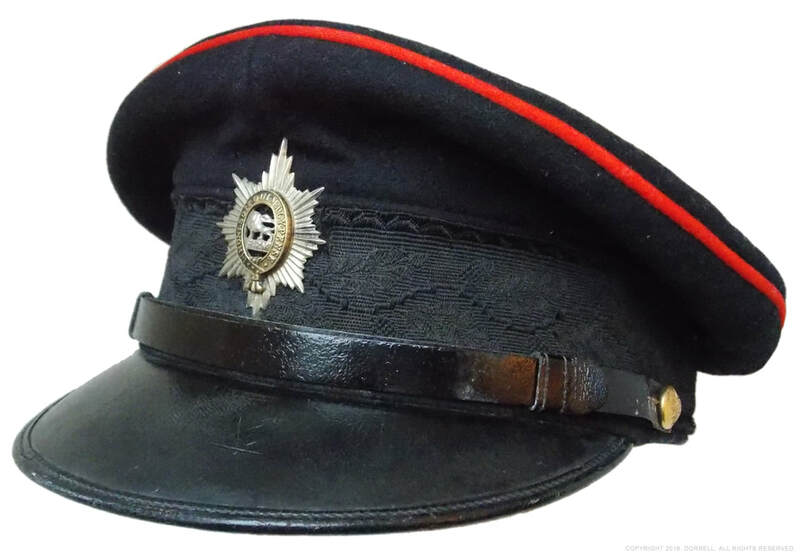 No doubt this gave the wearer a little extra personal style and also reflects how officers wore their badges on the coloured side hat versions, as can be observed below. Second World War Worcestershire Regiment Officer's Field Service cap. Brown barathea body with Sterling silver regimental collar badge cap badge, made by Gaunt of London. General List bronze buttons. Badge is the prong and loop type. Beige cotton lining with brown khaki velvet sweatband. Not maker marked. Other Ranks' Field Service Hat. 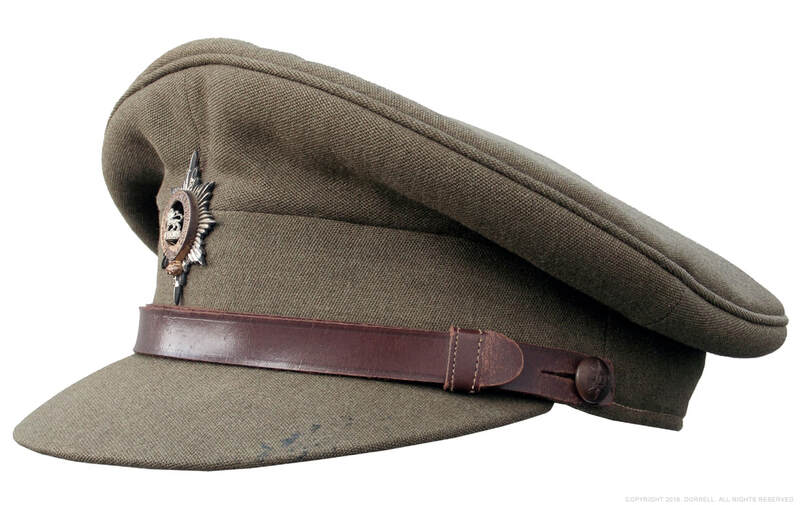 Field Service caps were introduced in 1937 to replace the stiff and unpractical Service Dress peaked caps, worn extensively during the First World War and interwar period. Made from serge wool the FS hat featured a peak and side curtain that could be folded down affording the wearer a small degree of protection against the wind and cold. 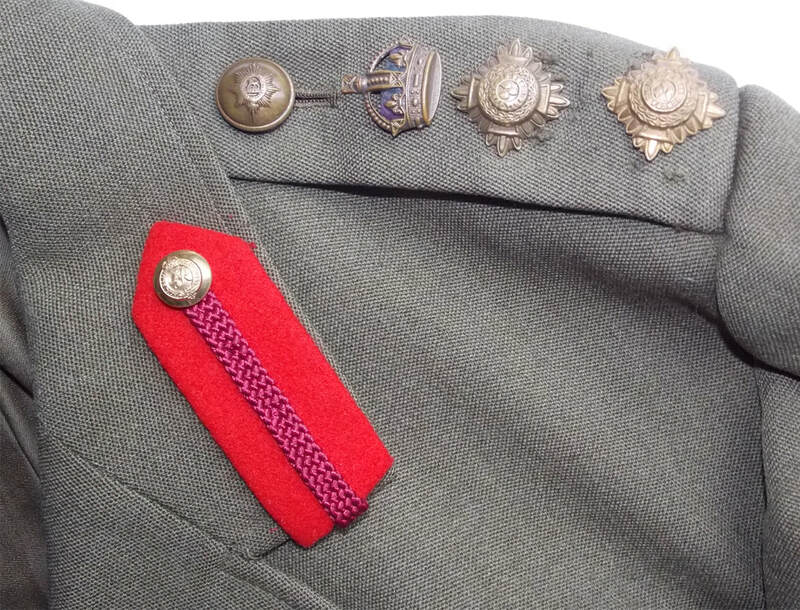 Other Rank FS caps, like this example dating to 1941, were fitted with brass General List side buttons with the regimental cap badge was worn on the left side. 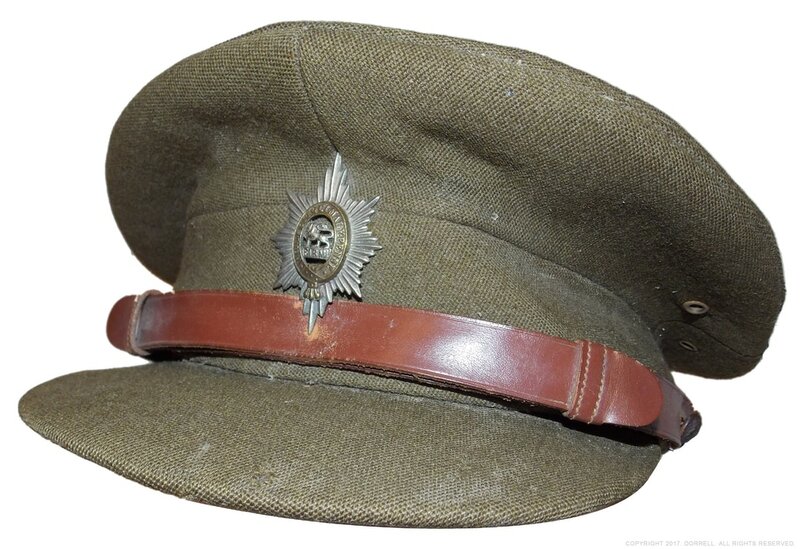 From 1943 the lesser favoured General Service hat (as can be seen below) began to replace the FS cap. 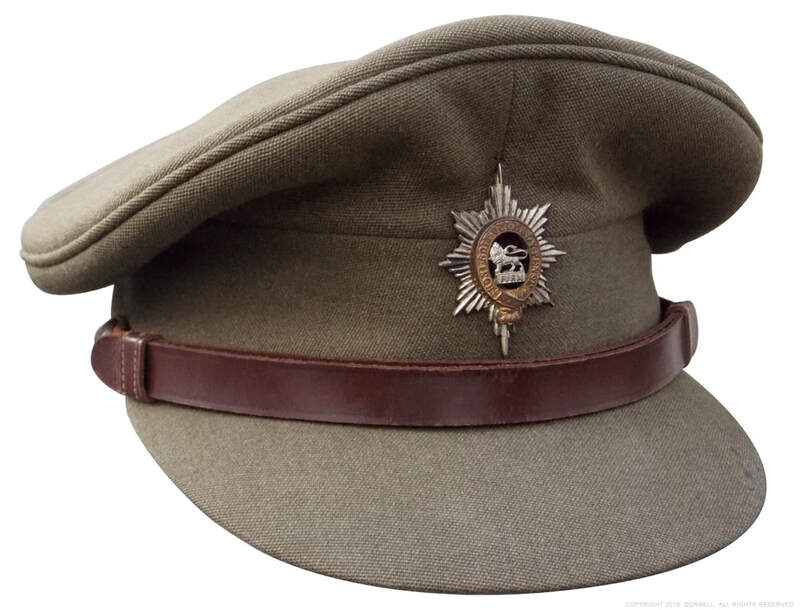 The FS hat was not only issued to regular units but the Home Guard also. 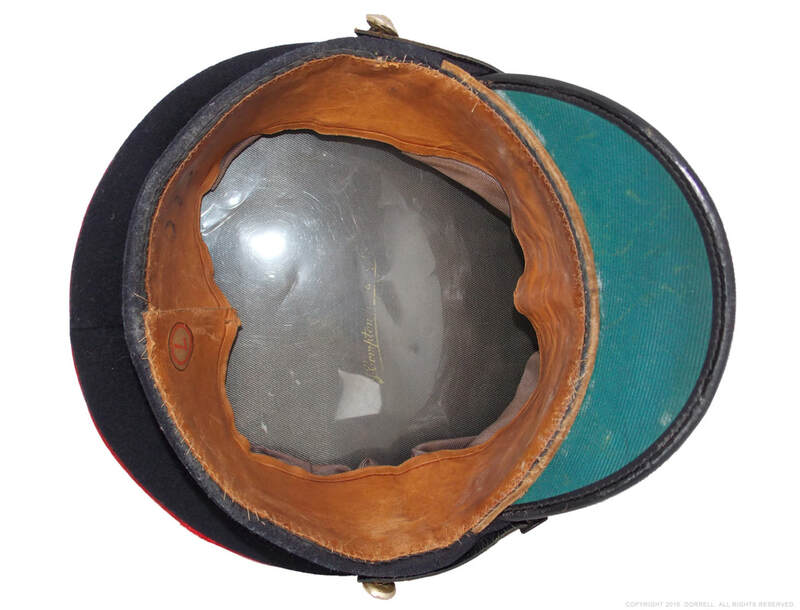 World War II Enlisted Man's Field Service cap. Other Ranks FS hat lining. Brown serge body with WR badge and General List bronze buttons. Badge is the slide variant. Beige cotton lining with brown khaki sweatband. Maker is L. Silberston Ltd.
Coloured Field Service caps were private purchase caps which were only allowed to be worn off-duty. Second World War Worcestershire Regiment Officer's Coloured FS cap. Fine dark emerald green felt body with dark blue flaps, featuring heavy gold-wire piping. The WR badge is as that used on the tunic collar. Maker is Hawkes & Co. Ltd of London. A private purchase Coloured Field Service cap. Note the varied shade of emerald green compared to the other example featured. Interestingly the cap still displays it original price label and although it is not named, it has a cotton label with a partial serial number written. Fine emerald green felt body with dark blue flaps, featuring heavy gold-wire piping. The WR badge is as that used on the tunic collar. Maker is Flights Ltd of London. 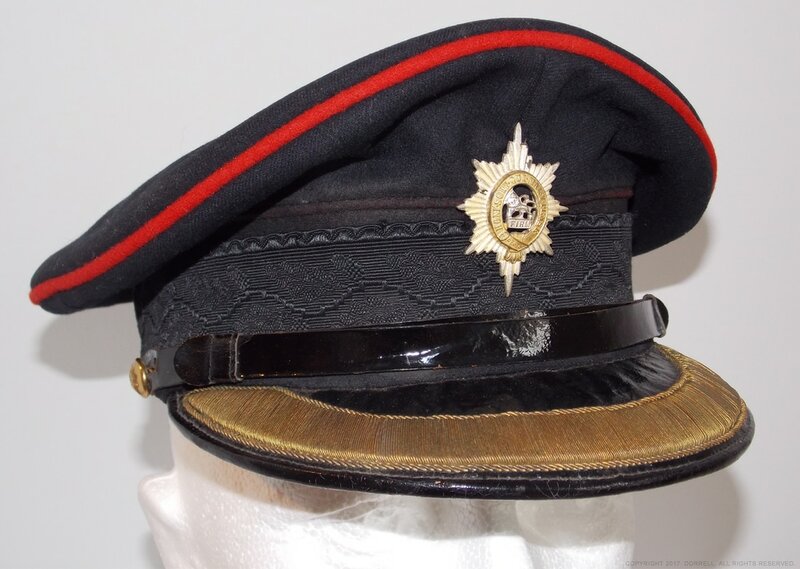 This coloured side hat is quite unusual being a late 1960s period Worcestershire example, considering that the regiment was amalgamated in 1970. The buttons are Anodised Aluminium and as on the previous exhibits, it displays a collar badge. As with all such officer hats the quality and workmanship is exceptional. 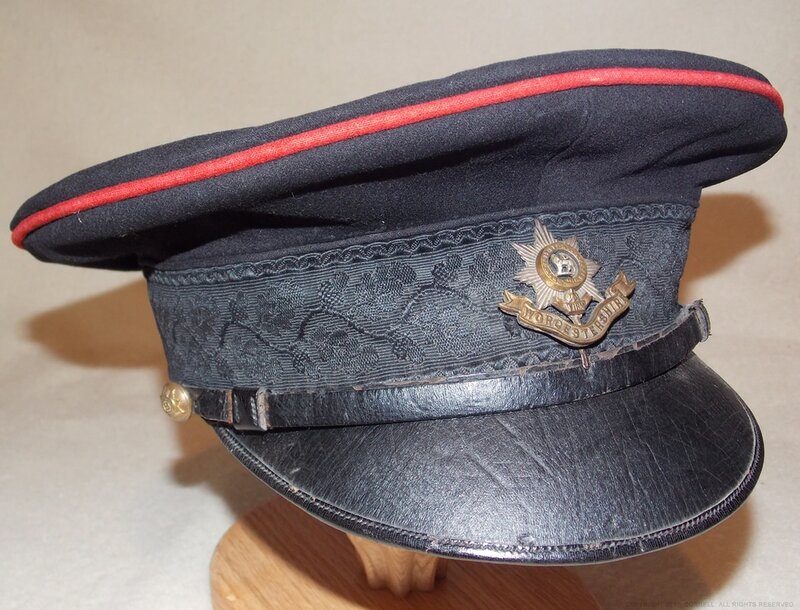 1960s Worcestershire Regiment Officer's Coloured FS cap. Fine emerald green felt body with dark blue flaps, featuring heavy gold-wire piping. The WR badge is as that used on the tunic collar. AA side buttons. Maker is Herbert Johnson. 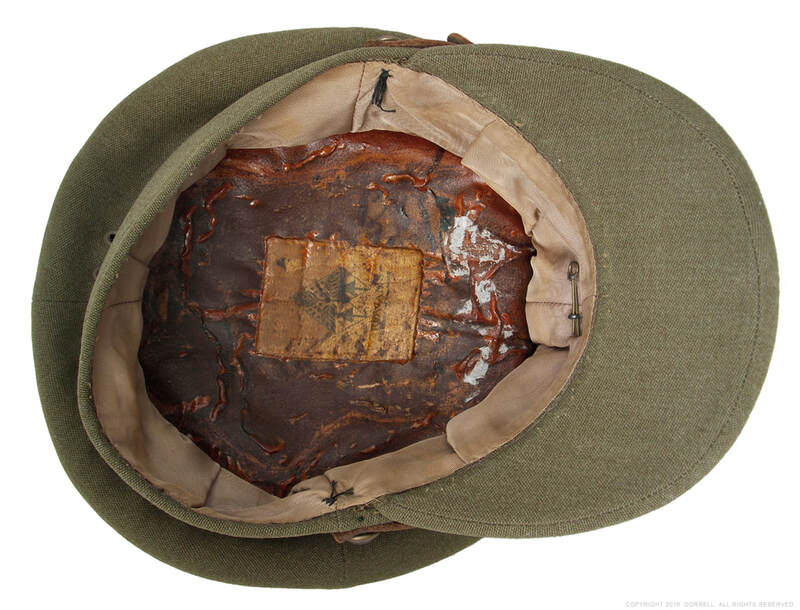 Enlisted Man's Coloured Field Service Cap of Alfred Neale. Alfred Neale was enlisted into the 11th Battalion, Worcestershire Regiment in 1940 and became part of the newly reformed 1st Battalion, Worcestershire Regiment in 1943*. After extensive training the 1st Battalion (43rd Division) disembarked in Normandy on the 22nd June 1944. Shortly afterwards Alfred Neale was wounded in action near Caen and was then shipped back to Britain. * Following the near decimation of the 1st Worc. R at Tobruk, in June 1942, the Battalion was reformed on the 1st of January 1943, using the 11th Battalion as its core. Second World War Worcestershire Regiment Enlisted man's Coloured FS cap. Emerald green body with dark blue flaps. The WR badge is the slide variant. General List bronze buttons. Black cotton lining. Maker is G. A. Dunn of London. Enlisted Man's Coloured Field Service Cap. 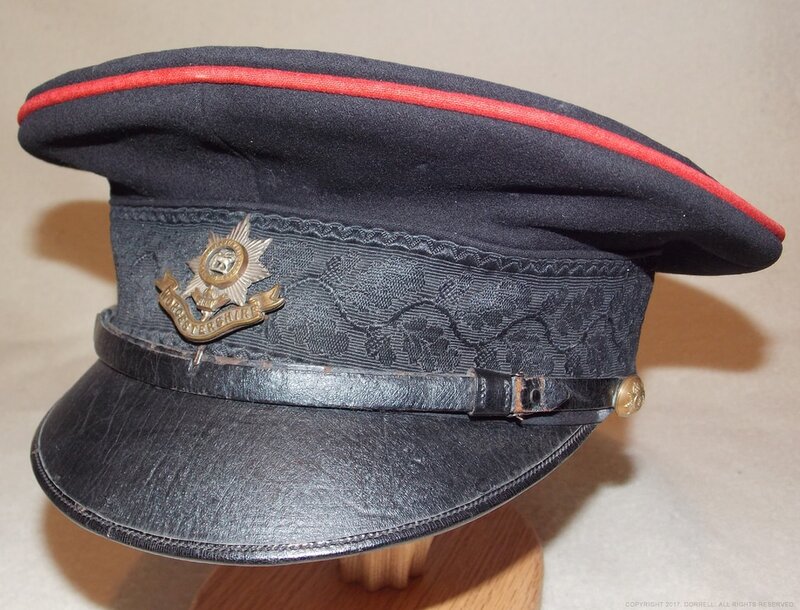 A beautiful and alternate example of an other ranks private purchase side hat. While the cut and felt material reflect more to the officer's pattern, the lack of heavy goldwire piping together with the minimalist lining confirm it as being an enlisted man's example. Emerald green felt body with dark blue felt flaps. Regimental bi-metal cap badge with slide attachment. General List bronze buttons, marked Buttons LTD. of Birmingham. Black cotton lining with white cloth sweatband, unmarked. 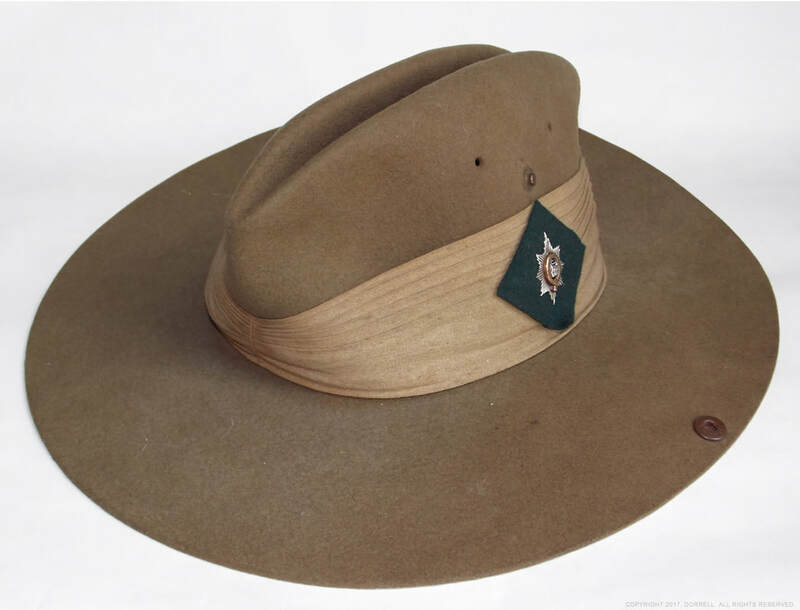 The General Service hat, or GS hat, was introduced in 1943 to replace the FS cap, however it wasn't until 1944 that many soldiers received theirs. The hat was not favoured highly by those that wore it and became know as the "Cap Ridiculous". 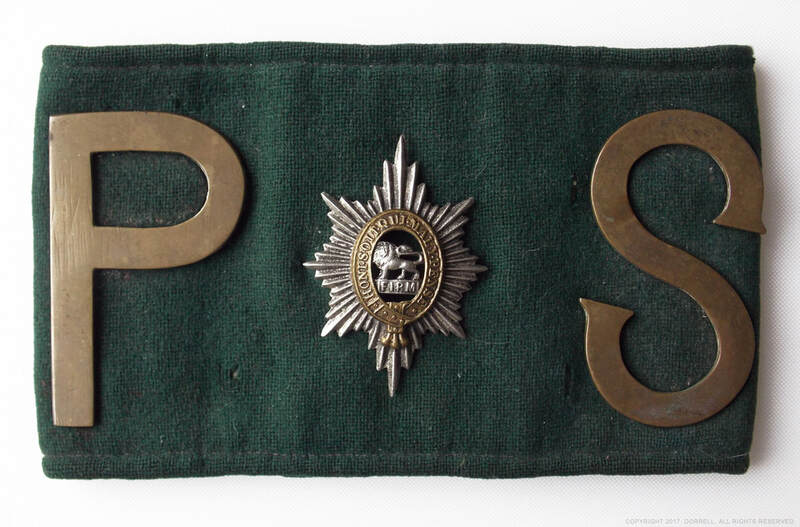 This example is typical of those worn by the 1st Battalion Worcestershire Regiment in 1944 and 1945, in North West Europe, featuring a rectangular/square emerald green patch surmounted by the regiment badge. A near identical hat can be seen on the excellent worcestershireregiment.com website in a period photograph of Lt. Ronald Henry Jauncey, who took part in the advance on the Rhine river in 1945. 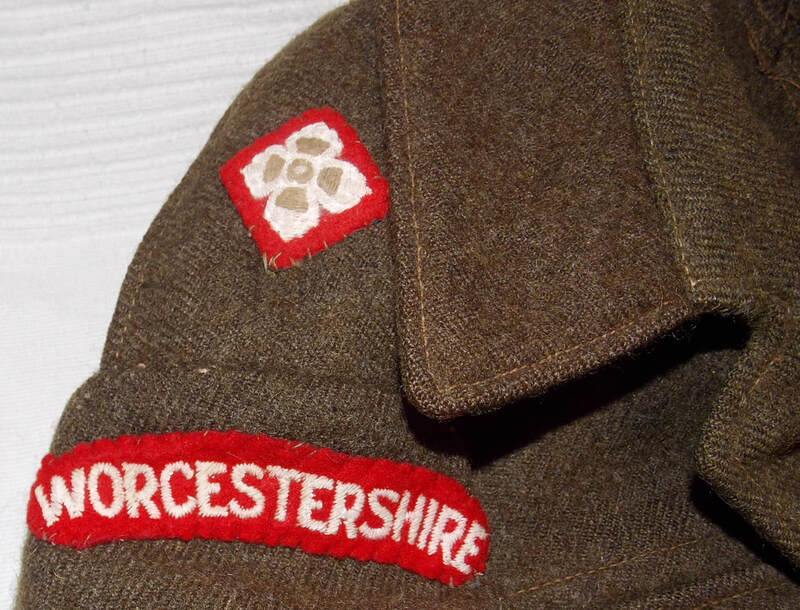 In most cases Worcestershire Regiment GS hats exhibited a square patch, until the end of the war when a diamond patch was worn prior to the hat's replacement by the khaki beret. It is interesting to note looking at the various coloured examples of greens shown here, as well as from other sources, how liberally the regulation term of "Emerald Green" was interpreted. WW2 Worcestershire Regiment GS hat. 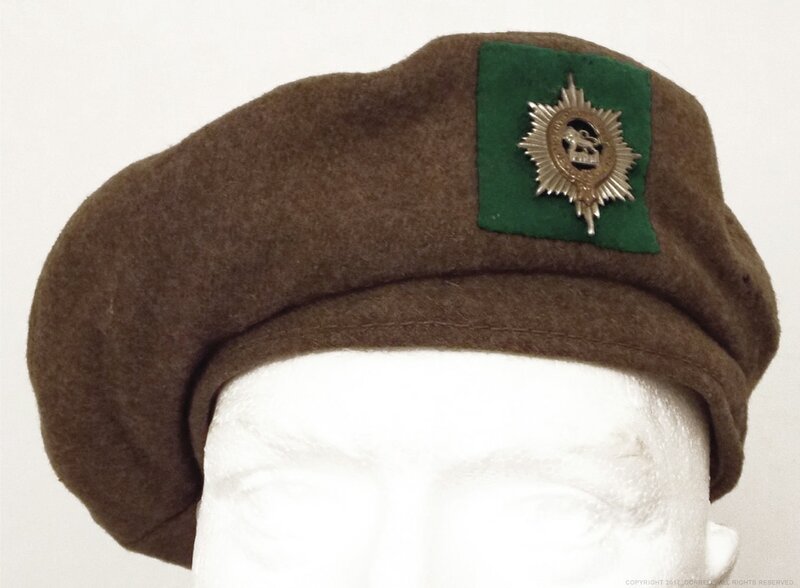 Brown khaki wool body fitted with a bi-metal cap badge, with slide, on an emerald green felt patch. Khaki cotton quilted lining. This is quite an interesting helmet with a sketchy past. It was acquired from Worcester and according to the little information shared by the family, it is believed to have been from a relative from Upton-upon-Severn, who served with the regiment. Without more definite details it is hard to research it further, however a soldier matching the family name was captured at Dunkirk in 1940 and again in 1942. The helmet's shell is the original factory green while the outer surface has been over painted in a desert clay camo, suggesting service in North Africa, perhaps even at Tobruk where the 1st Battalion was decimated in 1942. Unfortunately the outer surface has suffered badly over the prevailing years, showing water streak/rust damage, although areas and signs of the desert paint and green lower layer can be seen clearly. Desert camo shell with green khaki underside. Grouping to Lt. R. E. Leak. Lieutenant Robert Ernest Leak served from 1944 - 1948. In 1944 he was a cadet at 164 OCTU Barmouth, before accepting a commission as a Second Lieutenant in the Worcestershire Regiment, in 1945. According to his family, he served most of his time in Egypt. His group includes a set of printed shoulder titles with two pairs of Lieutenants rank slides. Also included is a regimental history booklet given to or purchased by new recruits, a booklet on the C.W.G truck and his cadet's college magazine, offering a rare insight into various aspects of being a cadet in 1944. The C.W.G booklet is well annotated and named, which may suggest that Lt. Leak was in the motor platoon? Red felt shoulder title badges, with white printed lettering and paper backing. Two sets of khaki embroidered rank slides for Lieutenant, on scarlet backing. O"C"TUPIA Coy's Magazine, dated November 1945. 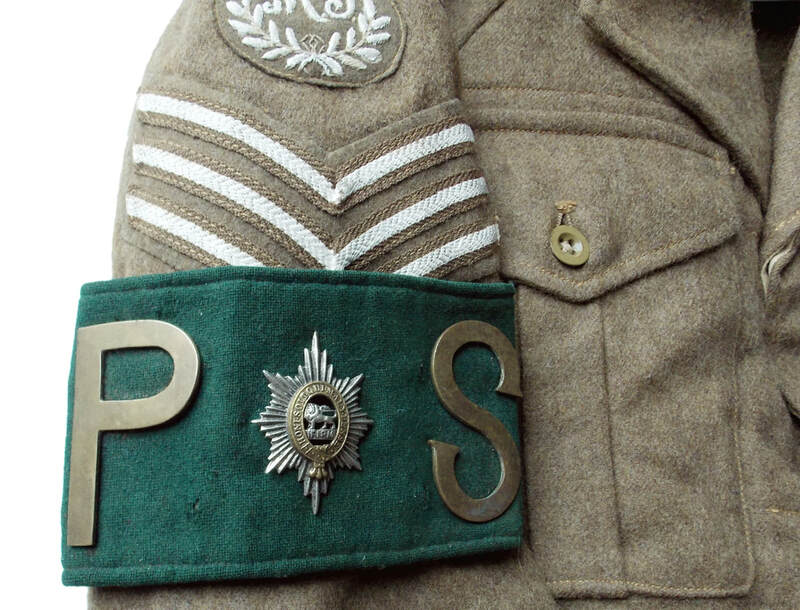 From studying period photographs of the Worcestershire Regiment it appears that the FS side cap was replaced by the GS cap sometime in 1944, with images showing a square green cloth patch being worn behind the cap badge, or in some instances no patch at all. At the end of the Second World War a diamond patch was being used on the GS cap, before it was gradually replaced by a khaki beret. 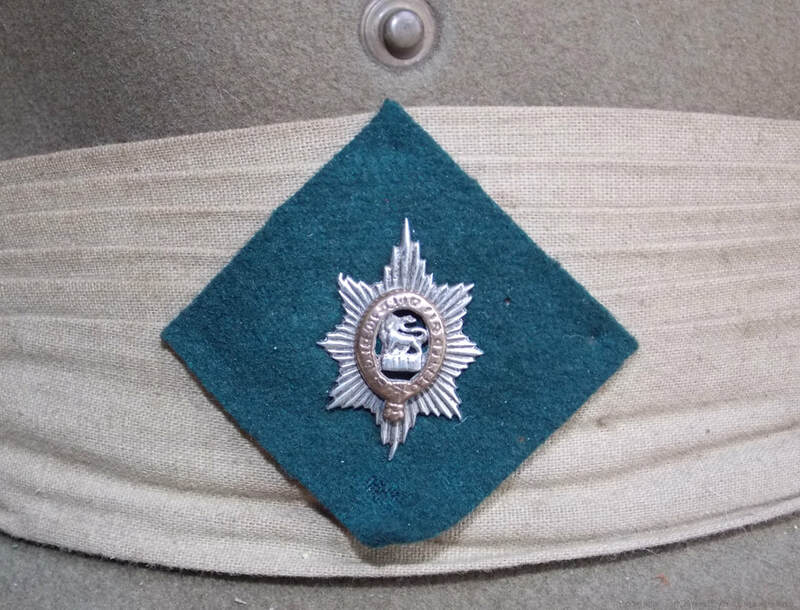 As with the later GS caps, berets prior to 1948 had a diamond green patch. Afterwards the patch shape changed to square and remained as such. 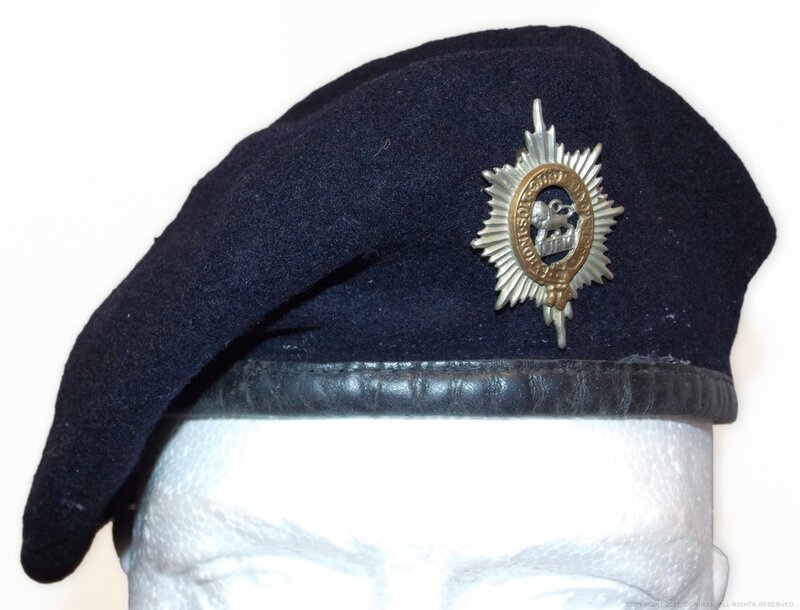 It would seem that sometime in or around 1955, the khaki beret was replaced by the dark blue version, worn until 2007. The featured beret is typical of those worn from around 1948 to 1955, as can be seen in this photograph of Major Denis James Patrickson giving the salute at the Kings Birthday Parade in 1948. Khaki body with black leather rim joining at the rear. 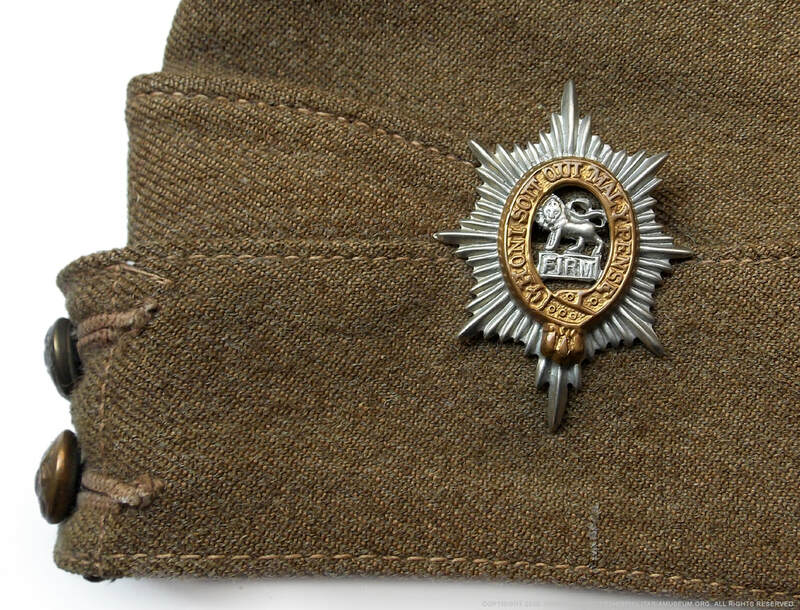 Bi-metal cap badge with slide, on grass green felt patch. Black cotton lining. Maker is Surpak Manufacturing Co. Ltd.
General Officer's beret - Late of Worcestershire Regiment? This early postwar beret is somewhat of a mystery. Khaki berets were used by Officers as well as certain regiments, including the Worcesters, from late WW2 onwards until the mid 1950s. As above, this example also features a grass green patch. 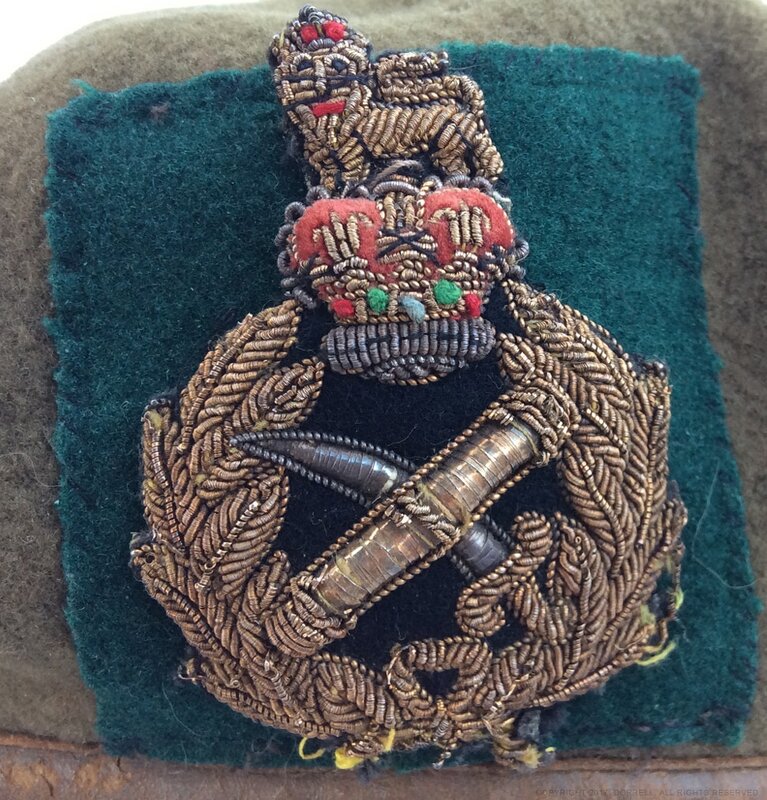 however a period Queen's Crown General Officer's cap badge has been neatly sewn onto the green patch. The beret and cap badge appear consistent to each other. Who wore this beret and why is a mystery. Could it have been a Worcestershire Regiment officer promoted to senior rank, keeping the green patch? Such as with RAChD or Dental Corps. senior officers displaying their distinctive coloured band on their Forage cap. Early postwar General Officer's beret. Late of Worcestershire Regiment? Post 1953 General Officer's badge. Khaki body with brown leather rim joining at the rear. Goldwire QC General Officer's cap badge, on grass green felt patch. Black cotton lining. Maker is Kangol Wear limited. Officer's Battledress Blouse. Mercian Brigade. 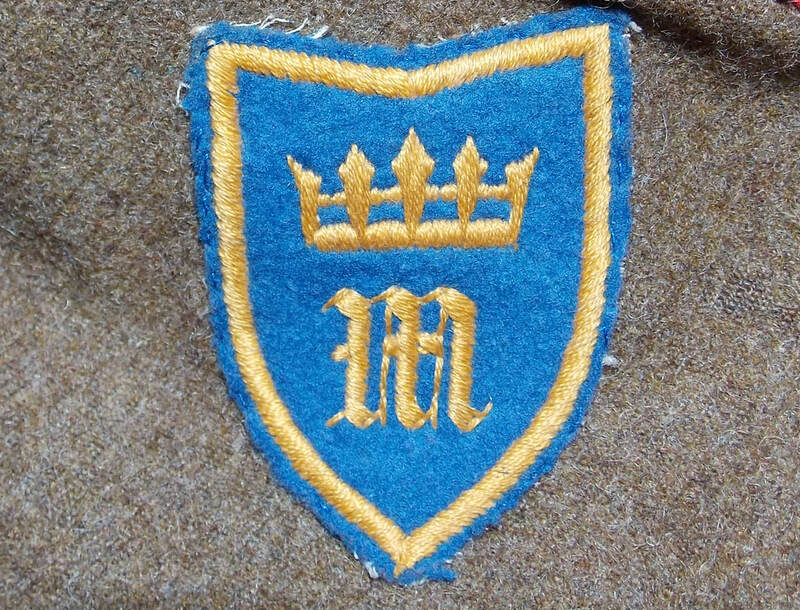 An un-named early postwar officer's battledress jacket displaying the 1st pattern shoulder patch of the Mercian Brigade. Evident from his rank and medal ribbons, this officer was a veteran of the 1st Battalion, serving in Western Europe during the Second World War. Post Second World War Worcestershire Regiment Officer's Battledress Blouse. Regimental shoulder title and infantry branch King's Crown Major's insignia. Mercian Brigade patch, Worcestershire Regiment. 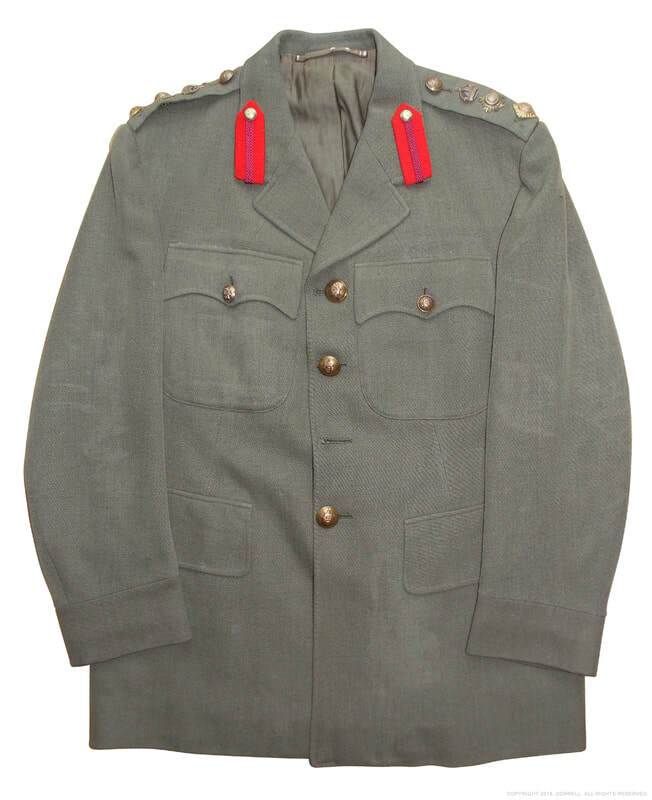 Officer's 1949 Pattern Battledress Blouse jacket with Worcestershire shoulder titles and cloth KC rank pips denoting that of Major. Worn on the upper left arm, under the title is a Mercian Brigade patch. Sterling silver regimental collar badges. The campaign medal ribbons display the 1939–45 Star, the Defence Medal and the War Medal 1939 - 1945. Maker is Albion Ltd.
OCTU Cadet's National Service grouping. ​This group comprises of a Cadet Officer's Worcestershire Regiment beret cap badge, regimental tie, shoulder titles and tunic buttons. The addition of the white disc denoted the status of Officer Cadet, an example of which can be seen in this photo from the Leicestershire (P. A. O) Yeomanry. Bi-metal WR cap badge on white Ivorine plastic disc. Red felt shoulder title badges, with white embroidered lettering (also whitewashed!) and hessian backing. Brass WR buttons, made by Firmin & Sons Ltd, London / Buttons Limited, Birmingham. 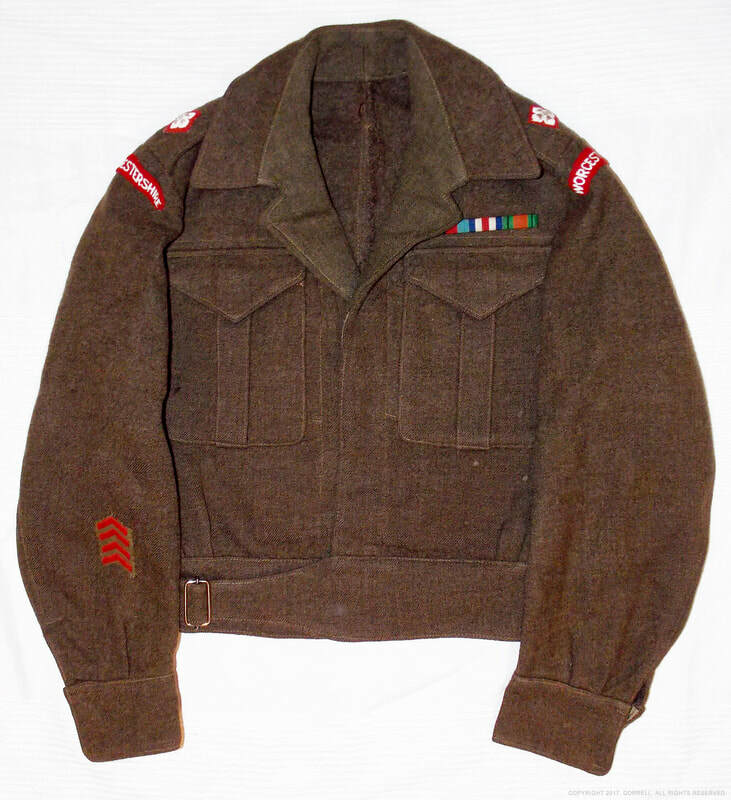 This initialled 1949 pattern other ranks battledress jacket was worn by a Corporal from the late 1950s onwards. As Sergeant Coltman's example exhibited, it also sports a matching pair of 48th Army Corps. shoulder patches. Post Second World War Worcestershire Regiment Corporal's Battledress Blouse. 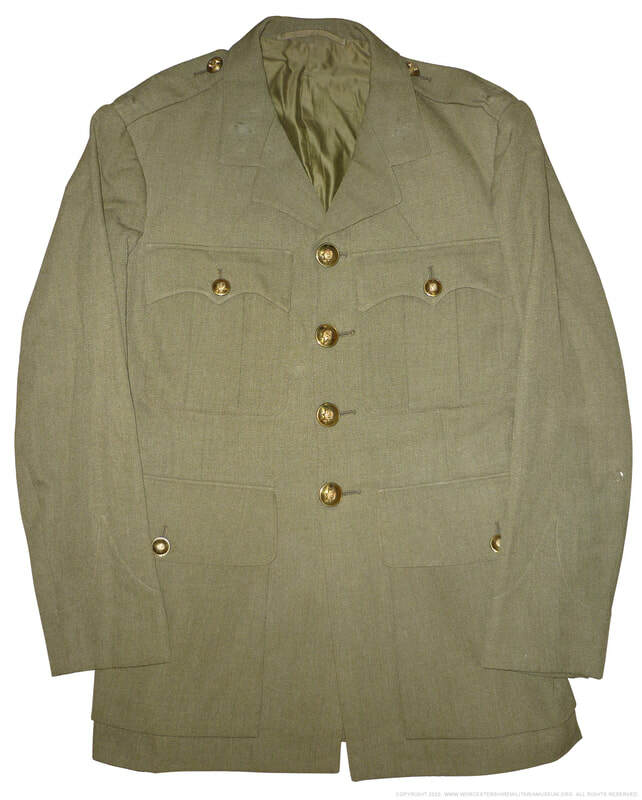 Other Rank's 1949 Pattern Battledress Blouse jacket with Worcestershire shoulder titles and cloth rank stripes denoting that of Corporal. Regimental collar badges. Worn on the upper arm, under the titles are a set of 48th Army Corps. patches. Maker is B. Bloom Ltd.
As of yet little is known about Sergeant Coltman. It appears that he saw operational service in Malaya, with C Company, 1st Battalion Worcestershire regiment, around 1952/1953. Perhaps being promoted fom Corporal in early 1953, serving in HQ Company. The General Service Medal is no doubt related to his Malaya service. Interestingly the cut of this particular 1949 pattern battledress lacks the waist belt detail. Post Second World War Worcestershire Regiment NCO's Battledress Blouse. Worcestershire Regiment staybright collar dog. Other Rank's 1949 Pattern Battledress Blouse jacket with Worcestershire shoulder titles and cloth rank stripes (white washed) denoting that of Sergeant. Anodised Aluminium regimental collar badges marked Firmin. Worn on the upper arm, under the titles are a set of 48th Army Corps. patches. A machine gun marksman arm badge is worn on the upper right sleeve. The General Service Medal ribbon is displayed. Maker is J. S. Thomson Ltd. Matching Worcestershire Regiment blue beret. 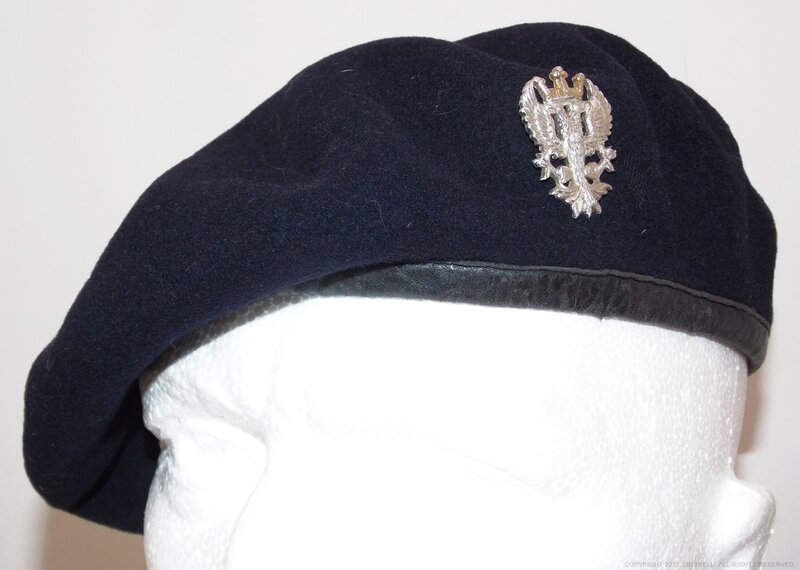 This beret is typical of what would have been worn with the Battledress Blouse above as well as by those men on National Service with the regiment. 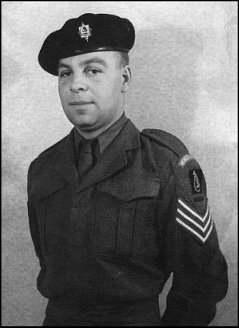 When National Service began in 1948, the dark blue beret was initially used along side the khaki beret until its replacement, albeit without the green badge backing panel. A 1949 period photograph of Sergeant F. V. H. Lynch (later Lt.Col Lynch MBE) serves to support this. As does an example on display at the Regimental Museum in Worcester. Dark blue body with black leather rim joining at the rear. Bi-metal cap badge with slide. Black cotton lining. Maker is British Beret Basque Ltd.
Worcestershire Regiment blue beret. Mercian Brigade. 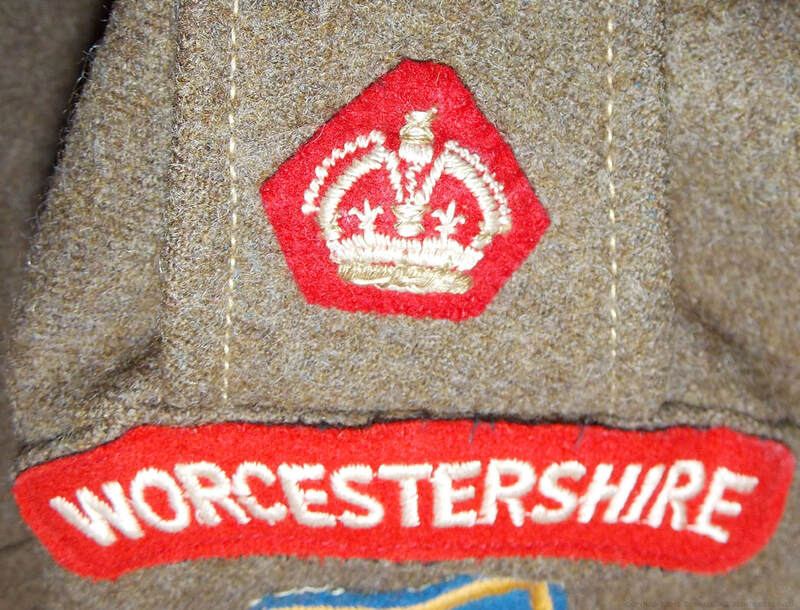 From 1958 to 1969 the Worcestershire Regiment, along side other Midland regiments, wore a standardised cap badge on their peak caps and berets. The Mercian Brigade cap badge featured a doubled headed crowned eagle with outspread wings, similar to what was later adopted by the Mercian Regiment in 2007. Compare the badges here. An image of the beret being worn can be seen below, while more information about the Mercian Training Brigade can be read at the Karkee Web Homepage. 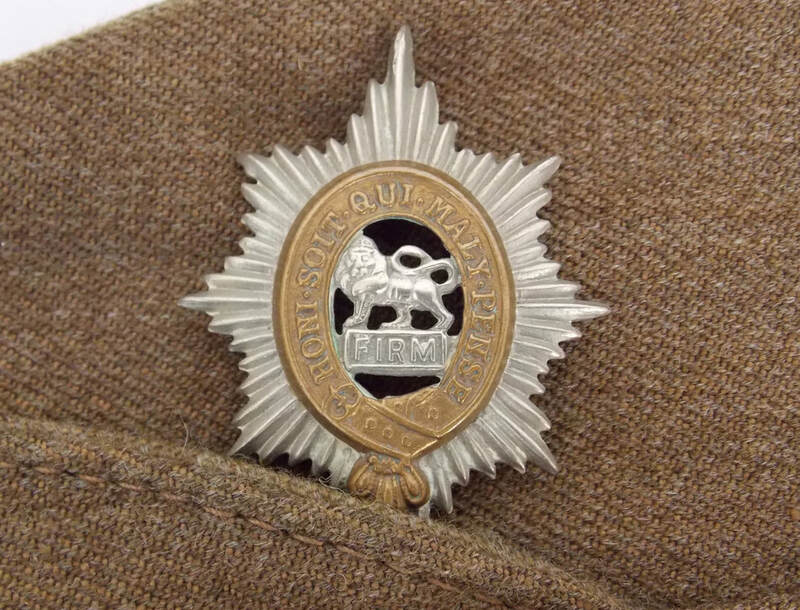 Postwar Mercian Brigade, Worcestershire Regiment beret. Dark blue body with black leather rim joining at the rear. Bi-metal cap badge with slide. Black cotton lining. Maker is Kangol Wear Limited. 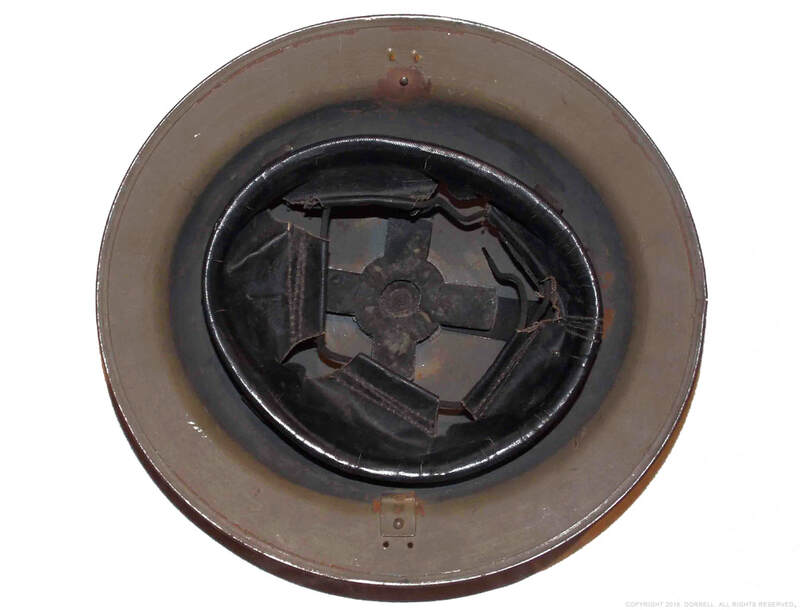 Other Ranks service issue Forage cap. This cap is quite a scarce example of an early postwar Worcestershire Regiment enlisted man's No1. Dress cap, which dates to the early 1950s. 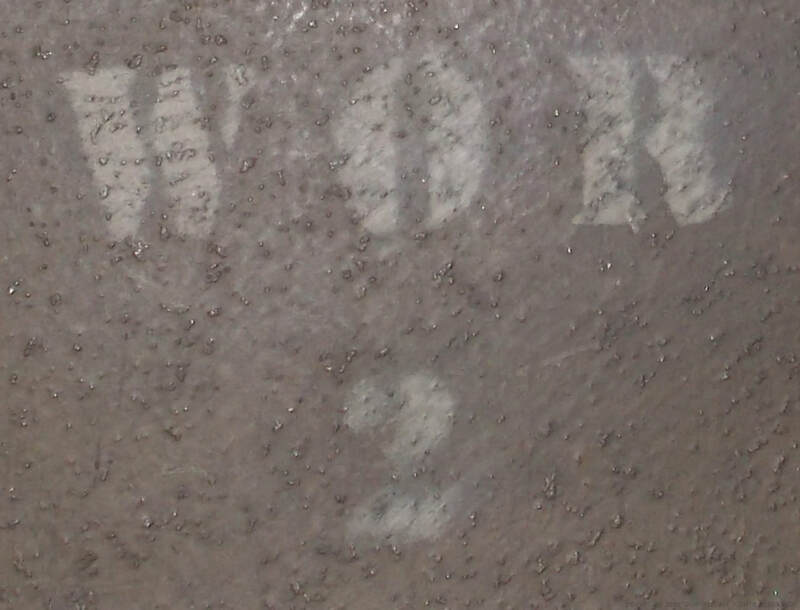 While it is un-named it still retains the last four digits of the original owner's serial number. Such caps were used on formal parades and ceremonial occasions. The use of Staybrite buttons indicates the cap as being from 1952 onwards, while its regimental cap badge confines its date to before 1958. 1950s Worcestershire Regiment Field Other Rank's Dress cap. Worcestershire Regiment cap side button. 1952 - 1970. Worcestershire Regiment Other Ranks service issue cap lining. Other Rank's No.1 Dress cap. Anodised Aluminium regimental side buttons with bi-metal regimental cap badge. Leather chinstrap and peak. Maker is J. Compton Sons & Webb Ltd. of London. Officer's caps of Lt. Colonel A. L. O. Jerram MBE. Lt. Colonel Anthony Lionel Oldershaw Jerram MBE graduated from Sandhurst in 1958, as a Second Lieutenant, and gradually rose through the ranks before achieving that of Lt. Colonel. In 1978 he was awarded an MBE and in 1989 retired from active service. In 1961, an Officer of "A" Company, 1st Battalion Worcestershire Regiment, he was posted to Middlesex, British Hondorus, to help deal with the devastation left by Hurricane Hattie. More information can be found at the Worcestershire Regiment Website here. Lt. Col. A. L. O. Jerram served both the Worcestershire Regiment and through into the Worcestershire & Sherwood Foresters Regiment, however as his Service cap still retains it original WR buttons, one would assume that he purchased a newer cap upon promotion to Major in 1970, which is when the Regiment was amalgamated and WFR side buttons introduced. 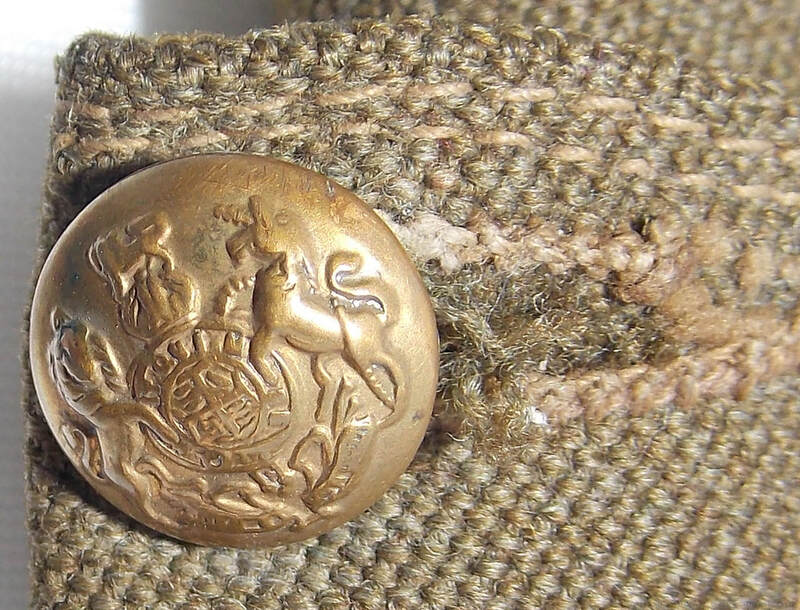 ​Major Jerram's Dress cap still retains it original Worcestershire Regiment side button which suggests that it was purchased prior to the regimental amalgamation. 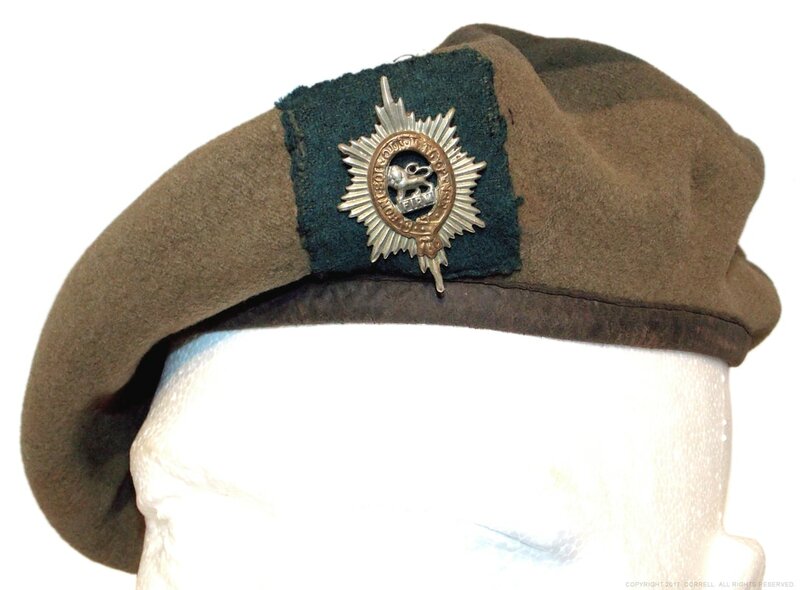 Interestingly, Dress caps worn between the period of 1958 - 1969 would have had the Mercian Brigade cap badge, as was the case with this example. 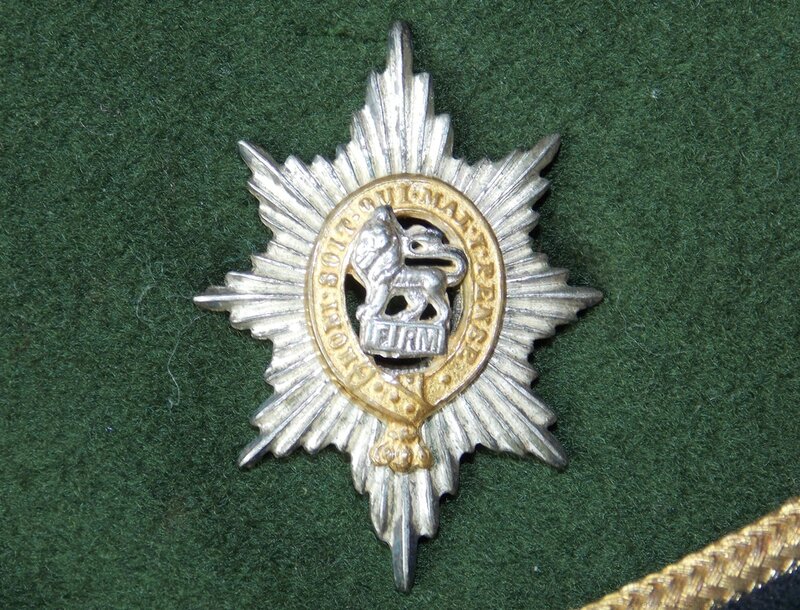 The Mercian Brigade badge was to be adopted in 2007 for the Mercian Regiment, which can be seen in a following gallery, albeit with a few minor differences. 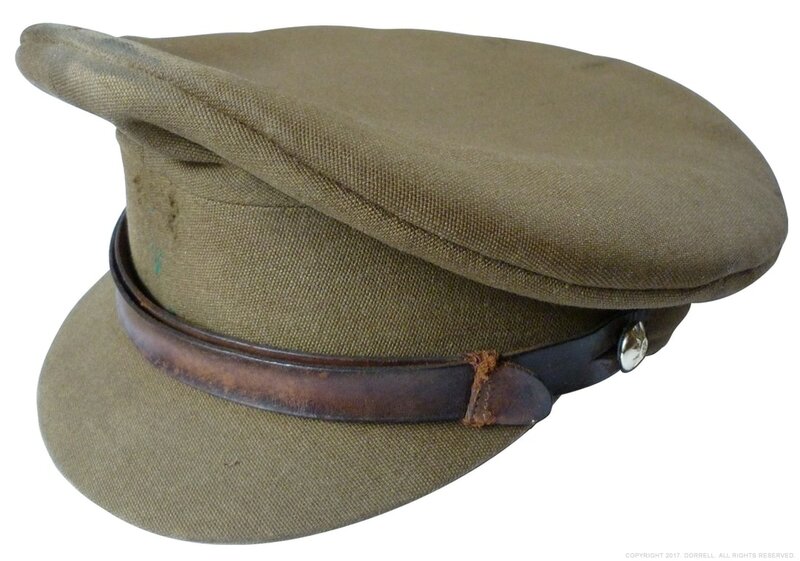 1960s Worcestershire Regiment Field Officer's Dress cap. Field Officer's Forage cap. Stay-bight WR side buttons with gold-wire band peak detail. Missing bi-metal cap badge. Maker is Herbert Johnson. 1958 period Worcestershire Regiment Officer's Service cap. 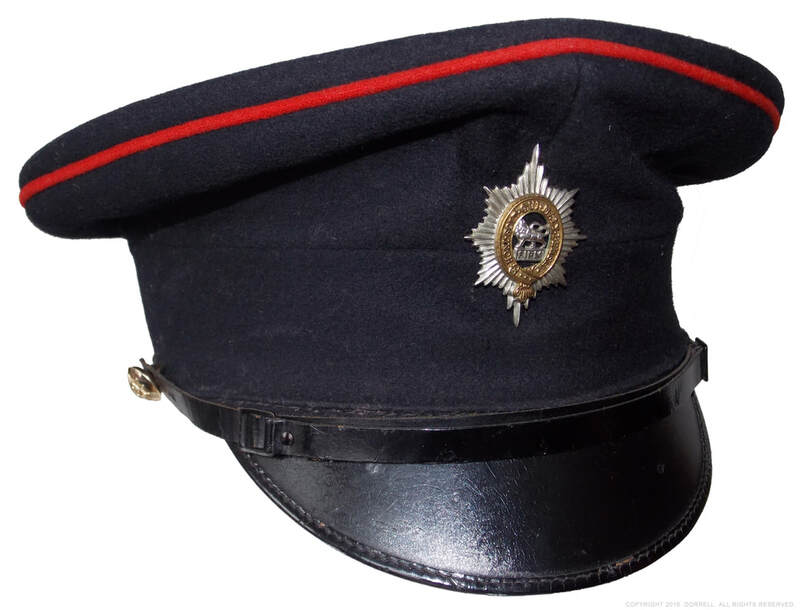 Officer's Service cap. Stay-bright WR side buttons. Missing WR cap badge. Maker is Herbert Johnson. The dress uniform was worn with the Forage cap, which in this particular case would have had a plain peak, seen above. The set is doubled named, which was not uncommon, as Officer's would sometimes sell their surplus uniforms, upon retirement or significant promotion. The set originally belonged to a Major C. Flint, but presumable was later sold to a Captain P. Love of the 7th Worcestershire Regiment. Incidentally Major C. P. Love wrote an excellent article on The Worcestershire Militia, in a 1969 edition of FIRM, the regimental magazine. Early 1950s Worcestershire Regiment Officer's Blue Patrol uniform. Officer's blue patrol jacket with brass WR buttons and rank pips denoting that of Captain. Missing collar badges. Maker is Flights Ltd of Camberley. Matching Trousers with a wide red band running down each leg. In comparison to the Officer's example above, featured is a 1950/1960s Sergeant's Dress Uniform Patrol Jacket. The soldier would have belonged to the Mercian Brigade and been based in Belfast, Northern Ireland. The single medal ribbon suggests that he began his career towards the end of the Second World War. Close-up detail of the epaulette grass emerald green piping. Worcestershire Regiment gold braid and emerald green sergeant's chevrons. NCO's blue patrol jacket with Stay-bright WR buttons and goldwire sergeant's chevrons worn on the right sleeve. Emerald green trim detailing. Fitted with its original bi-metal WR collar badges. Tunic displays the medal ribbon for the War Medal 1939 - 1945. Maker is Jackson. 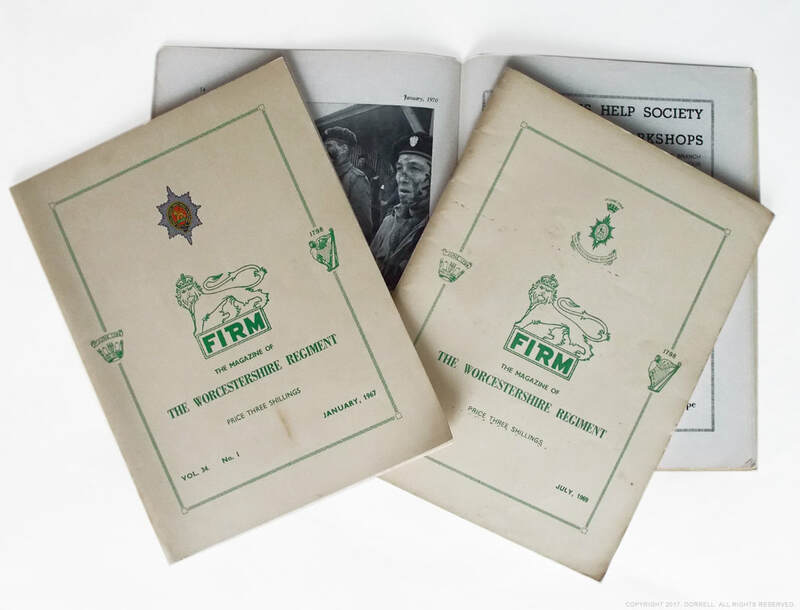 Three late editions of FIRM, The Magazine of the Worcestershire Regiment. These key magazines are interesting in their own right, but importantly show the attitude of the regiment during the last years of the Mercian Brigade and indeed the regiment itself before its amalgamation. It gives a broad perspective of everyday "news", such as platoon updates and sporting achievements, as well as listing many of the serving officers. The 1969 edition details life on a peace keeping tour of Cyprus, while the 1970 edition is particularly relevant. Paperback editions of FIRM, The Magazine of the Worcestershire Regiment. The Worcestershire Home Guard was made up of 12 Battalions covering the various regions of Worcestershire. Each Battalion consisted of a number of platoons responsible for sub-divisions of their Battalion's area, such as the 4th Battalion Worcestershire Home Guard, which covered Evesham and its immediate surrounding area, while the 7th Battalion Worcestershire Home Guard covered Malvern and its surrounding area. Interestingly, the 7th Battalion of the Worcestershire Home Guard, Madresfield Platoon, was responsible for guarding and defending Madresfield, a village less than 2 miles east of Malvern Link. During the Second World War, due to its ideal location, Madresfield Court was chosen as a temporary seat for the British Royal Family, should the Germans have invaded in 1940, and Buckingham Palace evacuated. For more details about Madresfield Court's role read the Daily Telegraph's story here. Field Service Cap of Kenneth Burbridge. 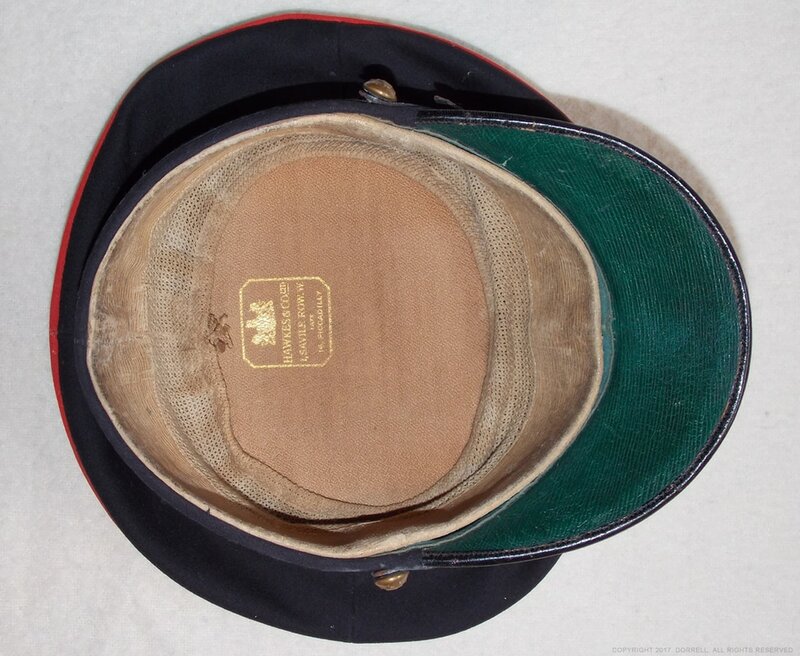 This Home Guard side cap was worn by Kenneth Burbridge, from Rainbow Hill in Worcester. Mr Burbridge was a member of the 1st Battalion Worcestershire Home Guard, which was responsible for Worcester and its immediate surrounding area. 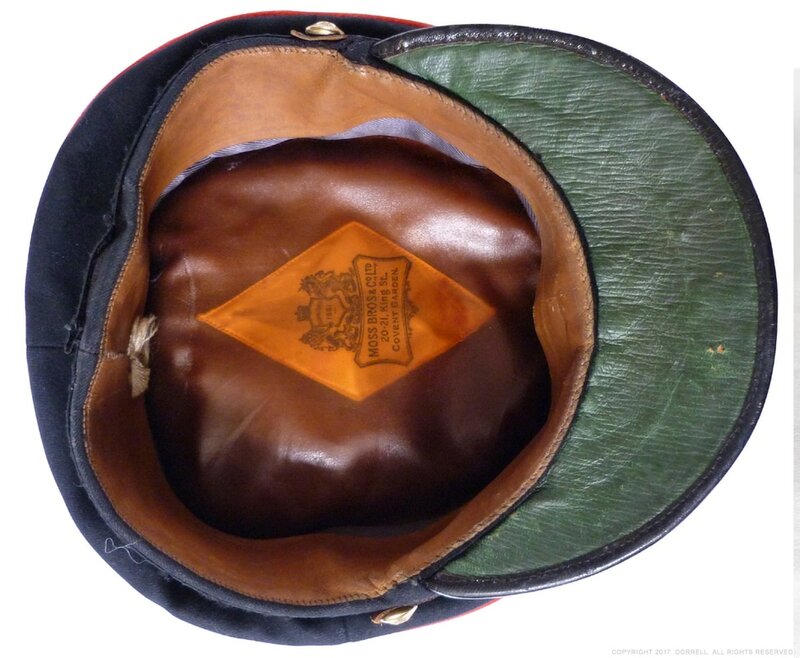 Second World War Worcestershire Regiment Home Guard's side cap. 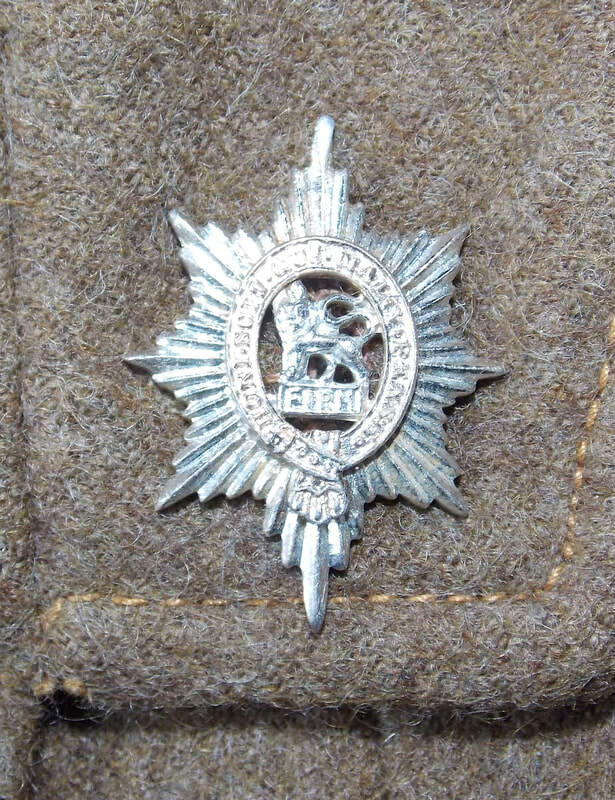 Worcestershire Regiment cap badge. 1923 - 1970. Brown serge body with WR badge and General List bronze buttons. Badge is the slide variant. Beige cotton lining with brown khaki sweatband. Maker is J. Compton Ltd.
Mk.II 2B Home Guard Helmet. During WW2, the Home Guard were also issued with steel helmets. After Dunkirk however the need to re-equip the army with helmets took precedence, resulting in the Home Guard being given sub-standard helmets. These helmets were not deemed good enough for front line troops and featured punched out holes either side of the chinstrap rivets to denote this. They were painted khaki and were often worn with a helmet net. Some units of the Home Guard added decals or painted markings to their helmets, as is the case here, however most HG helmets were standard finished. 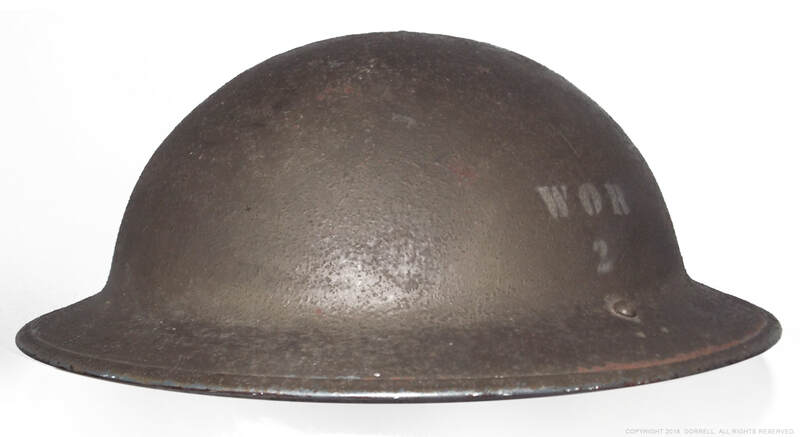 WOR 2 signifies that this helmet was used by the 2nd Battalion Worcestershire Regiment Home Guard, responsible for Bromsgrove and its immediate area. Worcestershire Regiment Home Guard steel helmet. Khaki shell with WOR 2 stencilled on the side. CSM Henry John Cotton served in the First World War with the 9th Worcestershire Regiment, where he was awarded the DCM for his actions in Mesopotamia, in 1917. Cotton was later commissioned and during the Second World War served with the 4th Worcestershire Regiment (Evesham) Home Guard. This cap, dating from 1941, was worn by Lieutenant H. J. Cotton during his time with the Home Guard. Second World War Worcestershire Regiment Officer's FS cap. 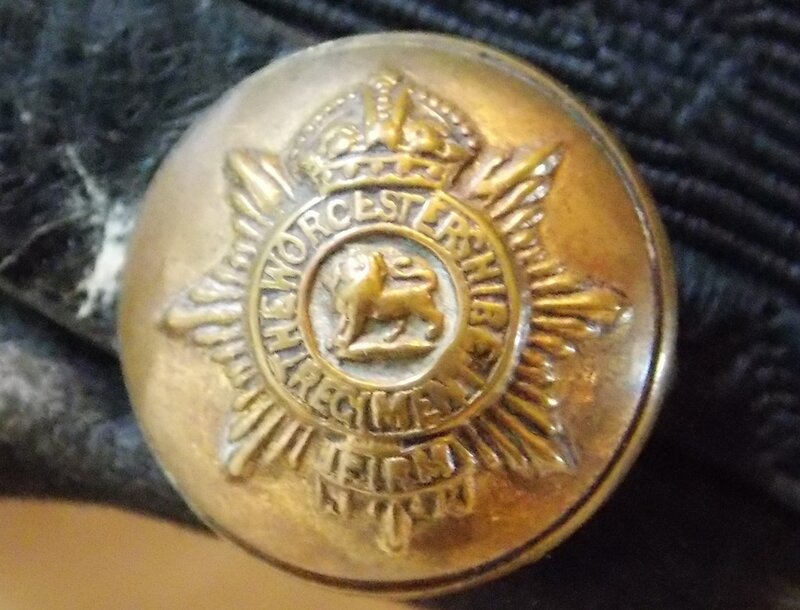 Second World War Worcestershire FS hat button. Worcestershire Regiment Home Guard hat badge. Brown khaki body with WR badge and General List bronze buttons. Badge is the slide variant. Beige cotton lining. Maker is F & R Dimmock. For more information on the 4th Battalion, Worcestershire Home Guard, please visit this great link. Field Service Cap of W. G. Bound. From initial research there is no record of a W. G. Bound having served in the Worcestershire Regiment during the Second World War, which would suggest that he was instead a member of the Home Guard. The addition of his initials and name written in the lining, rather than the other ranks customary serial number and surname would back up this assumption. 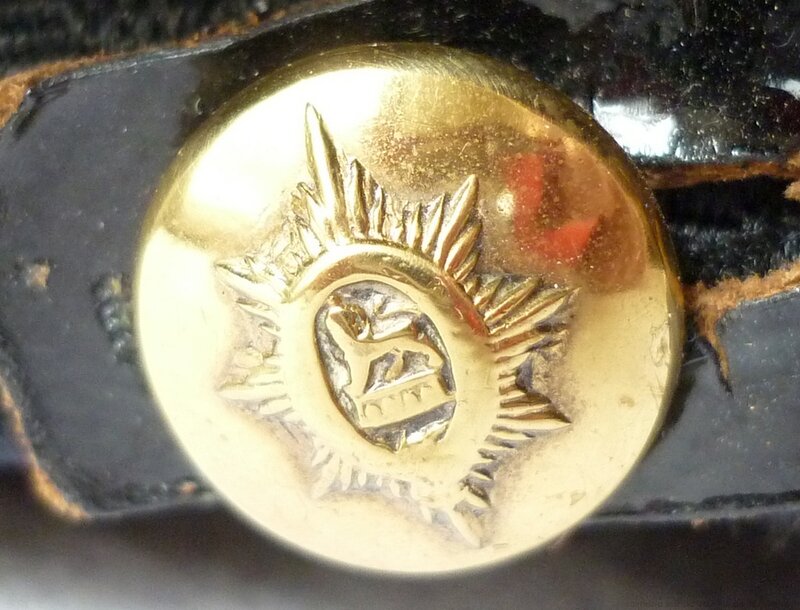 Whilst officer did often write their initials and names inside their caps and hats other ranks did not. Mr Bound may have been either an enlisted man or an officer in the Home Guard and still have worn an Other Ranks pattern FS hat. Second World War Worcestershire Regiment Field Service cap. Brown serge body with WR badge and General List bronze buttons. Badge is the slide variant. Beige cotton lining with brown khaki sweatband. Maker is J. Collett Ltd. Please consider selling or donating your old regimental pieces to the museum. The museum is seeking exhibits This website and its content is copyright © Dorrell 2012 - 2019. All rights reserved.